I’ve ignored this space for months. The past few months have been eventful – we’ve had our share of the good, the bad, and the ugly. A few friends (R, M, and A) came together to form ‘Keetabi Keedas’, a book club that started on a very ambitious note. The plan was to read the Harvard Five Feet Shelf. It did not take us long to abandon the project, but we’ve continued to read together. We’ve created a whatsapp group and meet online once in a while to discuss everything under the sun, and sometimes the book. Our selections have been wide and varied. We’ve read the Reluctant Fundamentalist, Heart of Darkness, On the Road, I know why the caged bird sings, etc and are now wondering whether to read How to flirt with a naked werewolf!! While I was in Goa this weekend, A shared a quote she felt was ‘lovely’ – “We are so accustomed to disguise ourselves to others, that in the end we become disguised to ourselves.” R felt it was “very nice” while I found it sad. A responded by saying that she didn’t it was sad as much as true and that “we all wear mask everyday and at some point start thinking of ourselves only with that mask or label”. I felt it was true and yet sad and expressed the thought that we all need to have at least one person in front of whom we don’t need to wear a mask or one who can see through it. It was absolutely weird when within minutes of sending this Mahesh shared an observation about me that someone shared with him. My veil had been pierced. I didn’t know whether to laugh or to cry. I smiled and then proceeded to cry 🙂 Super weird! This was my third trip to Goa. The first trip had some funny moments. The highlight of my third trip was hanging out with M who also happened to be holidaying in Goa. She was in South Goa while I was in North Goa. 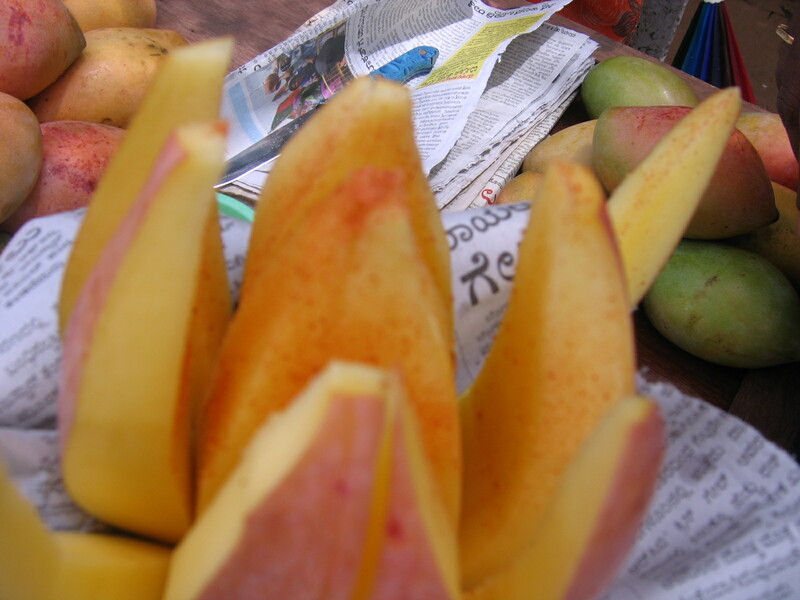 We met at Mapusa (pronounced maapsa) Market and explored the Friday market. We focused largely on the food. M did pick up some bangles too. We came across these super tiny pineapples. The sweet limes on the right give you an indication of how small they are. We were befriended by Anita, a lady from Gujarat, who spoke to us in English and insisted that we come to her shop. We told her that we wanted to explore food joints and would go to her shop after that. 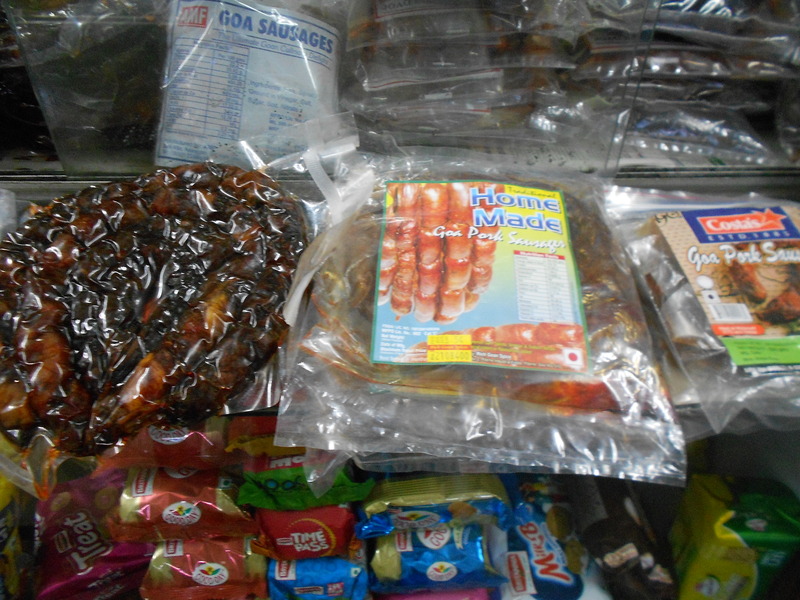 We walked into Luizinha’s where I picked up Goan sausages, fish curry masala, sorportel paste, and rechado paste. We were surprised to find Anita waiting for us outside Luizinha’s. We decided to check out her stall. She had a collection of pashmina shawls and cushion covers. We weren’t interested in either and she was quite upset about it. While M was looking at seeds for her mom, I got distracted by these murrukus being sold by two men from Rajasthan. 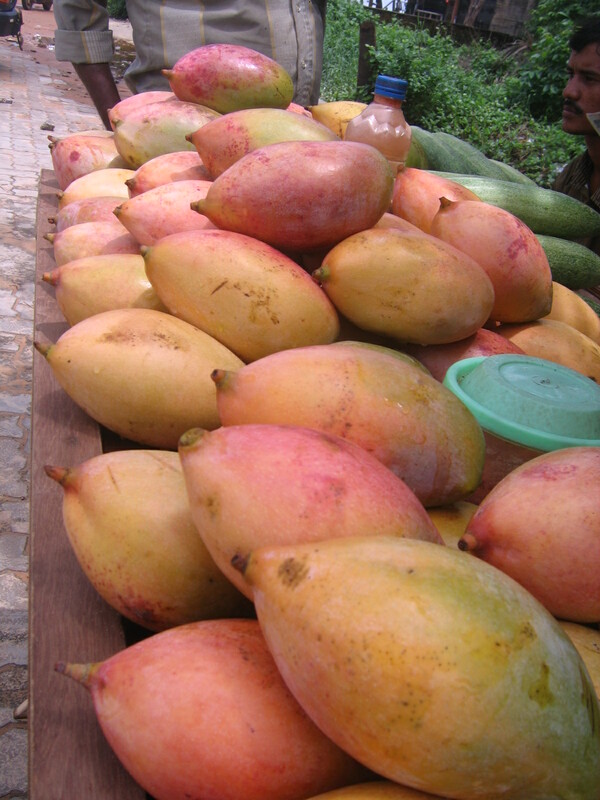 I tasted one and found it very unusual – it starts out sweet and then ends up being salty and spicy. We packed some for home. 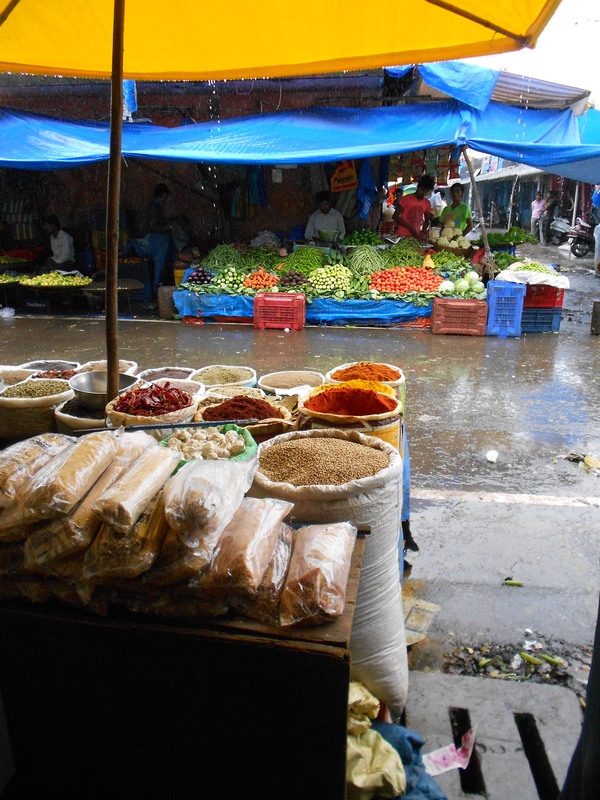 It started to rain while we were in the market, but that didn’t deter us in any way. 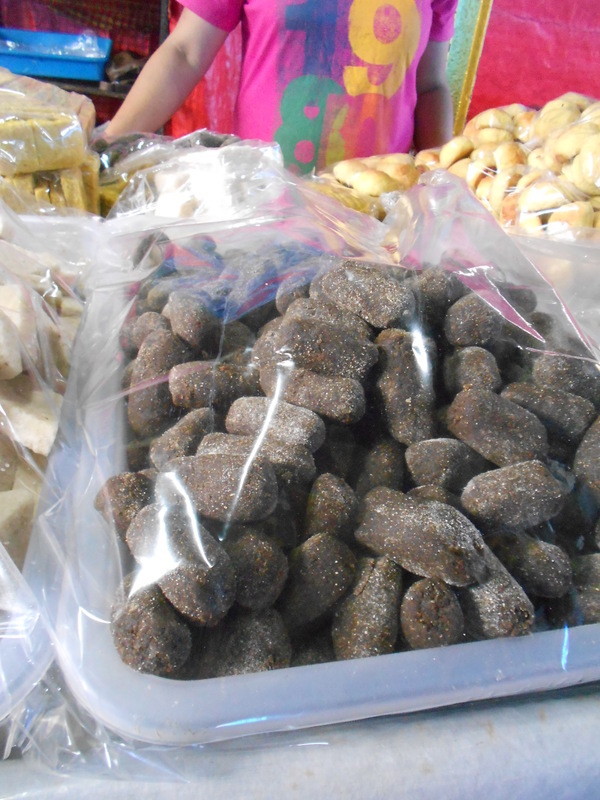 We sampled some local sweets prepared by a lady for Ganesh Chaturthi. We tried the coconut based barfi and guava jelly and packed some. We then headed to the hugely popular Simonia Bakery. 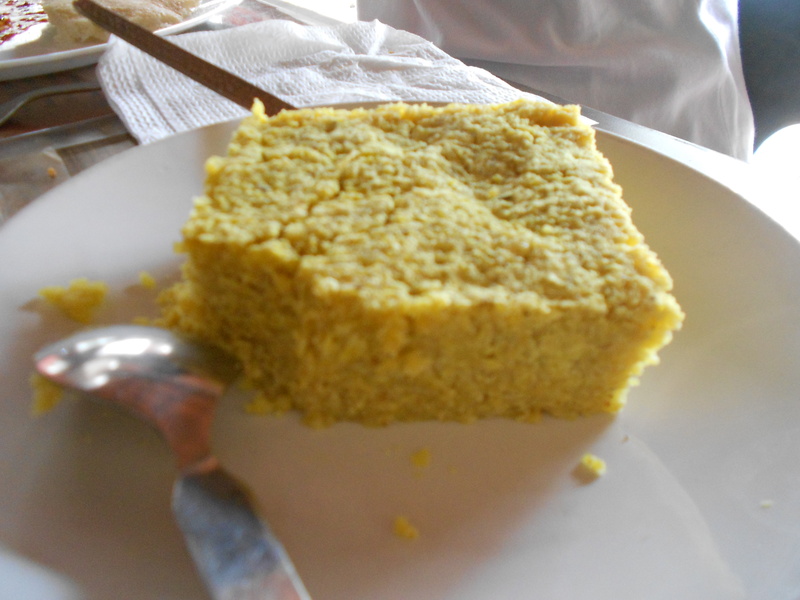 Our requests for a sample of bebinca and baath cake were brutally turned down. We had no option but to buy them 😛 we bought 500gms of bebinca and asked them to cut a slice for us to taste. One bite and we were in heaven. It was the best bebinca I’d ever eaten. We packed some more. M and I headed to Brittos (considered to be a ‘tourist trap’ by some) for lunch. 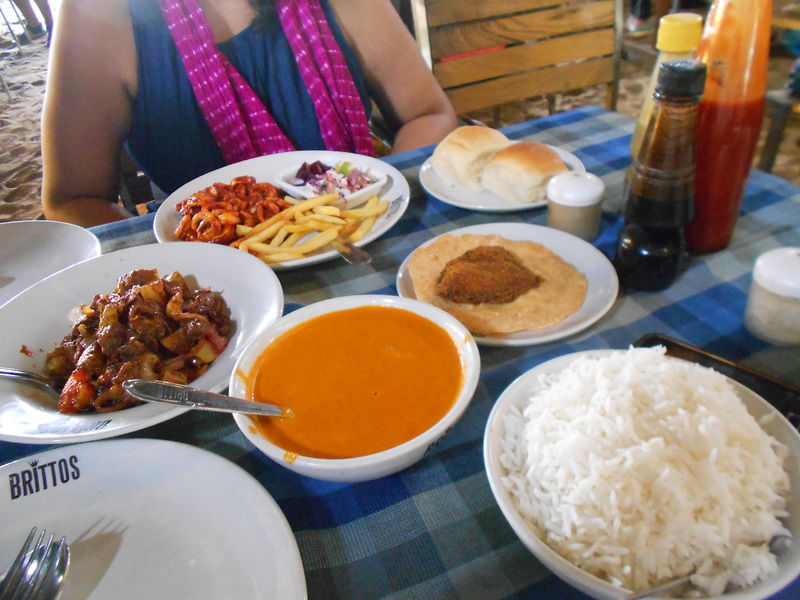 We ordered Sausage Chilli Fry, Calamari Rechado, and Goan Fish Curry. 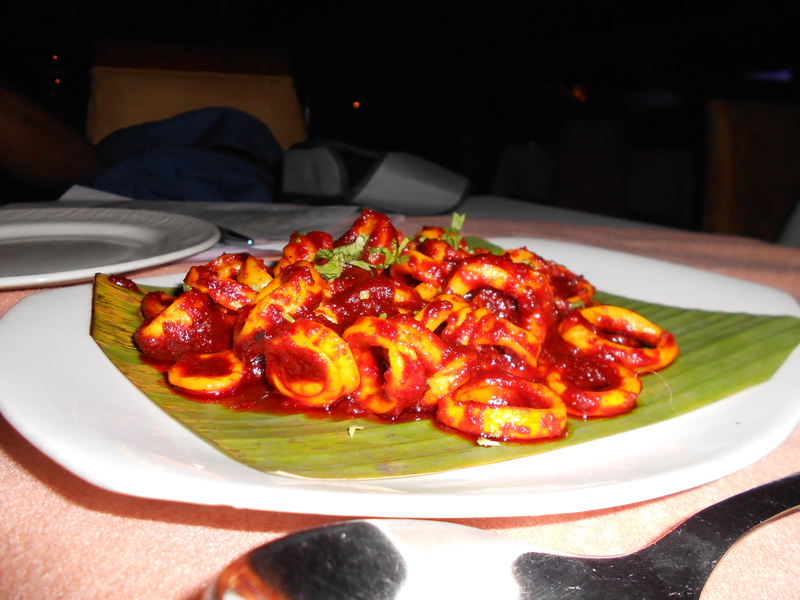 The Calamari was outstanding – it was perfectly cooked and the masala was yum. The curry was also very nice. This was a lot of food for the two of us, but we managed to polish a fair amount. We ended the mail with a yum slice of a Dark Chocolate Mousse Cake. We camped at Brittos for over 2 hours and thoroughly enjoyed ourselves. 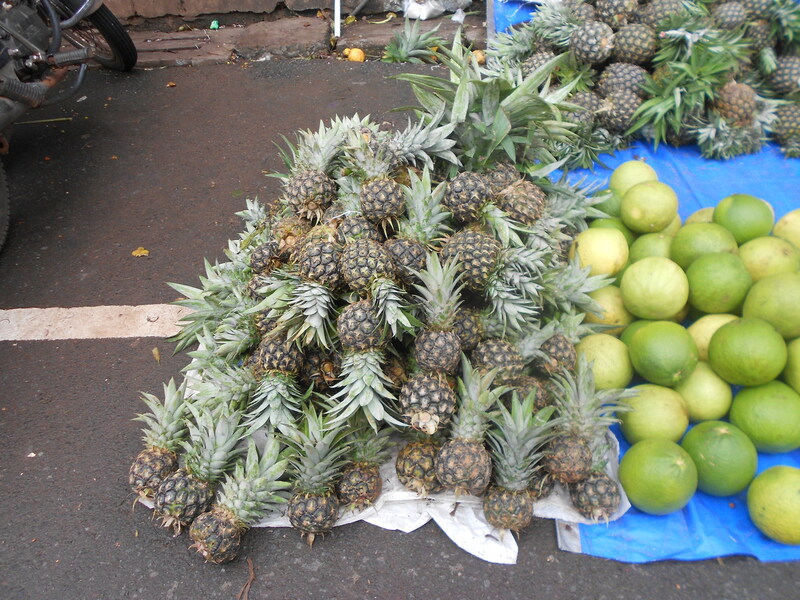 Here’s a picture of all the things I bought from Mapusa market. 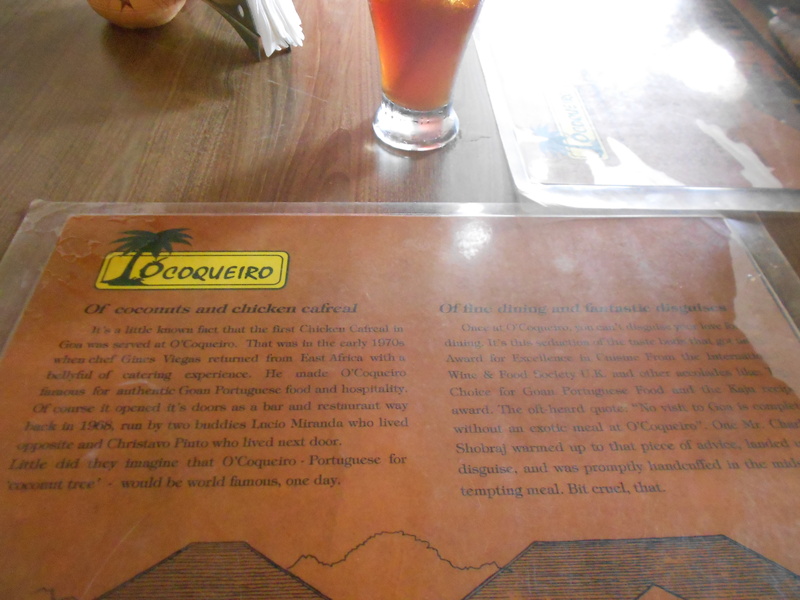 The next afternoon, Mahesh and I headed to O’coqueiro for lunch. On reaching there we realised that Charles Sobhraj had been arrested while eating at the restaurant. Wonder what he was eating and who paid for the meal. Look who got arrested here! 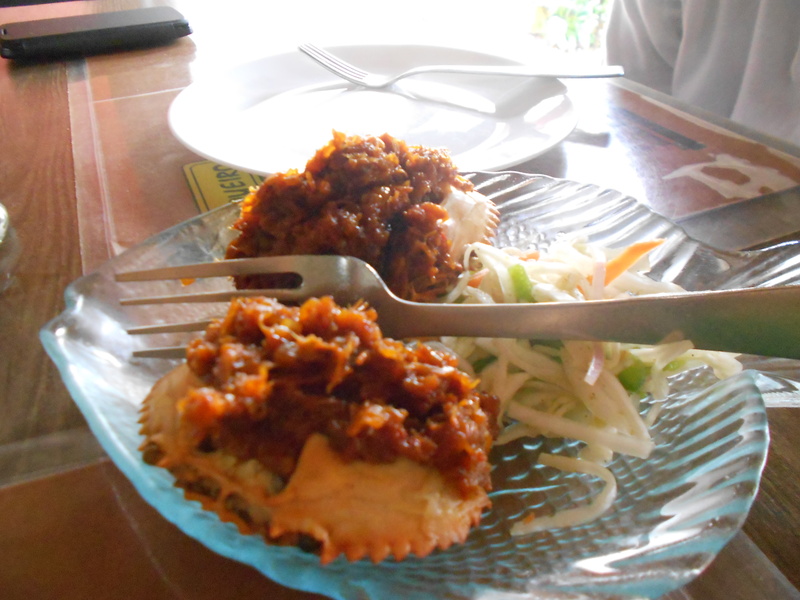 We ordered stuffed crab, clam cutlets, pork sorpotel and bread. The crabs were tiny but stuffed with crab meat. It was delicious. We couldn’t taste the clams at all and the cutlet was a letdown. We enjoyed the sorpotel which had liver and meat in a curry. We were in Chennai on the weekend to attend a wedding. We remembered our own wedding which included Bengali and Tamil ceremonies and felt happy. We also met four of our friends who had attended our wedding. The best moments from the wedding included a photo session where I was constantly being instructed to not show my teeth. I was laughing my head off at the ludicrous poses that the photographer was asking me to give. All our friends stood around us laughing while I was asked to feel Mahesh’s heartbeat, hug a chair, and look shy. Those pics are embarrassingly entertaining. While the professional photographer was composing his pictures, a friend clicked a pic of me standing on pillows to gain height! 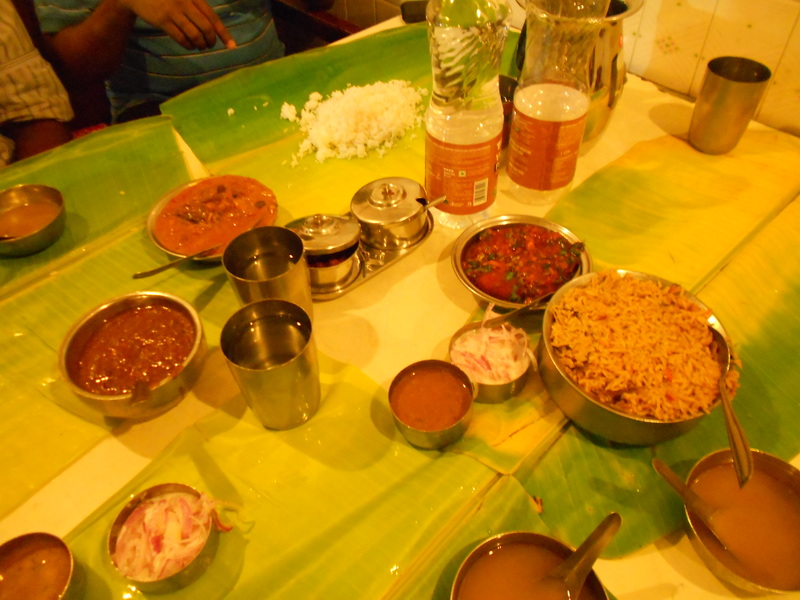 We were staying in T Nagar and wanted to eat Chettinad style food. Zomato came to my aid and I zeroed in on Amma in T.Nagar. The place has a lot of history. It is apparently owned by MGR’s personal cook and as per the auto guy who dropped my friend to the restaurant, been the venue of many important political meetings in the past. By the way, autos now run by meter in Chennai now. This is is big development in the State. We ordered two mutton biryanis, one meal, nethili fry, crab lollypop, turkey 65, fish curry, and Amma Special Chicken. We were served a complimentary chicken soup which was average. 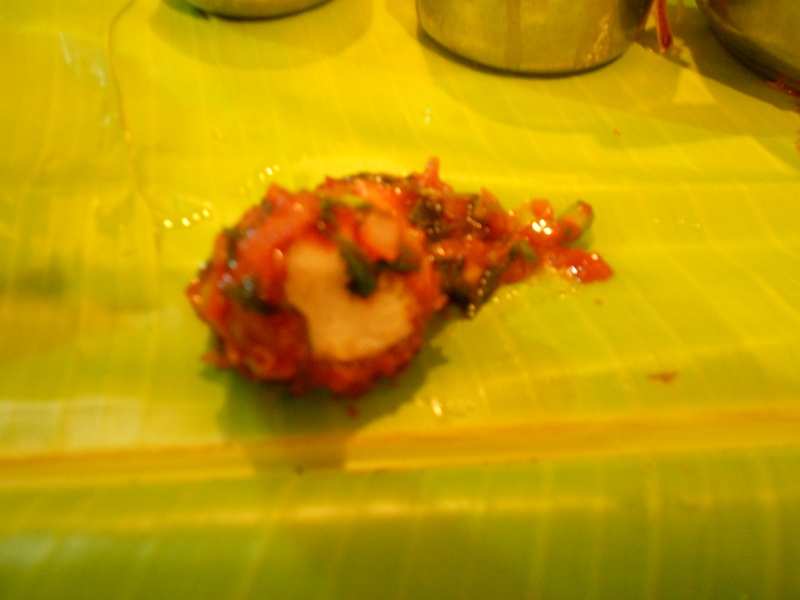 Our starters were crab lollypop, nethilli fry, and turkey 65. The turkey tasted just like chicken. 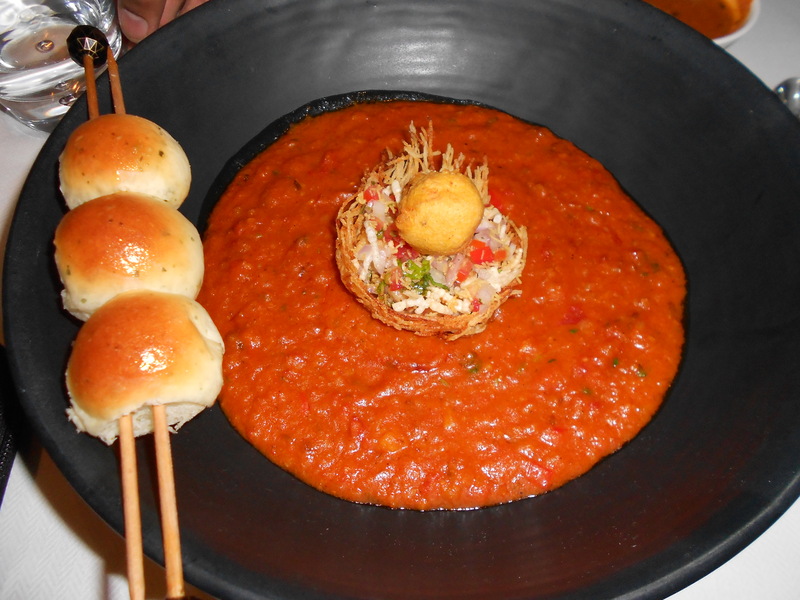 The nethilli fry was crunchy and yum and the crab lollypop was yum. I first thought it was maida with very little crab. To my delight it was all crab with a very thin coating of maida. 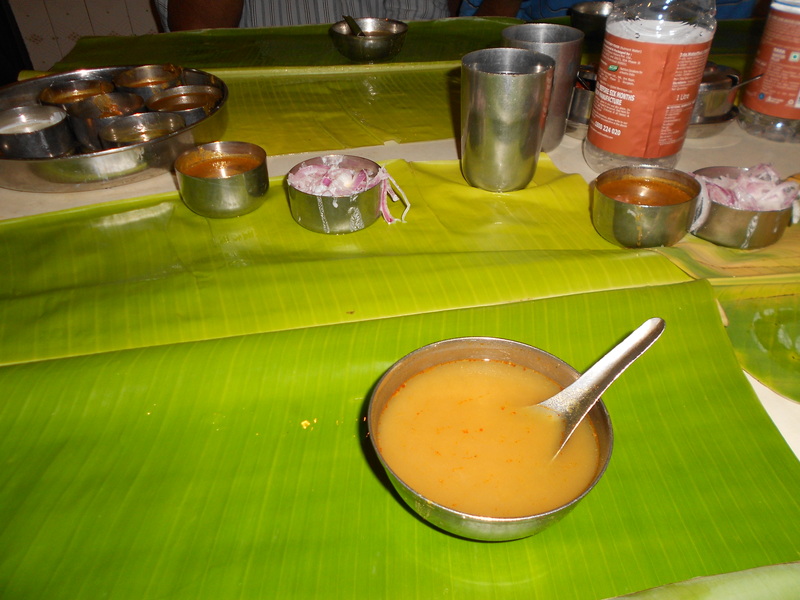 The thali came with sambhar, rasam, dal, a vegetable, and curd. Chicken curry was served on the side. 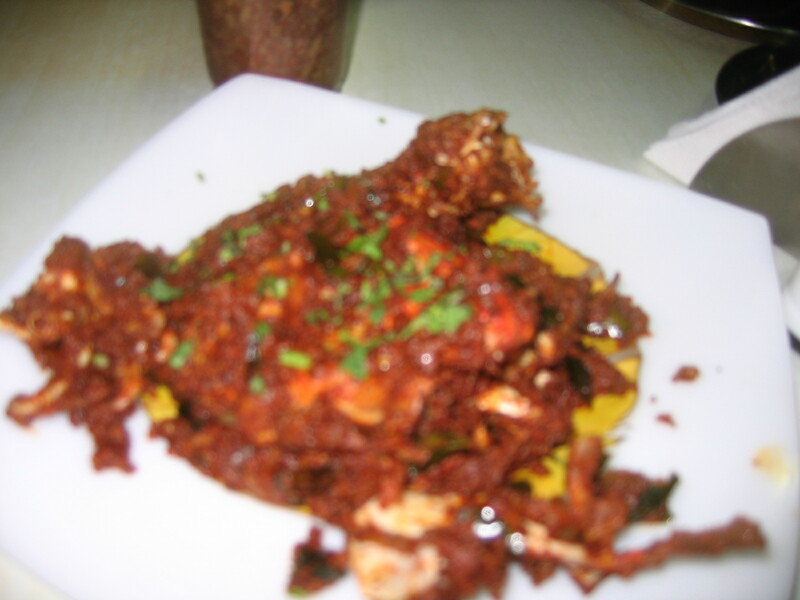 What really stood out was the nethili fry, fish curry, and the crab. 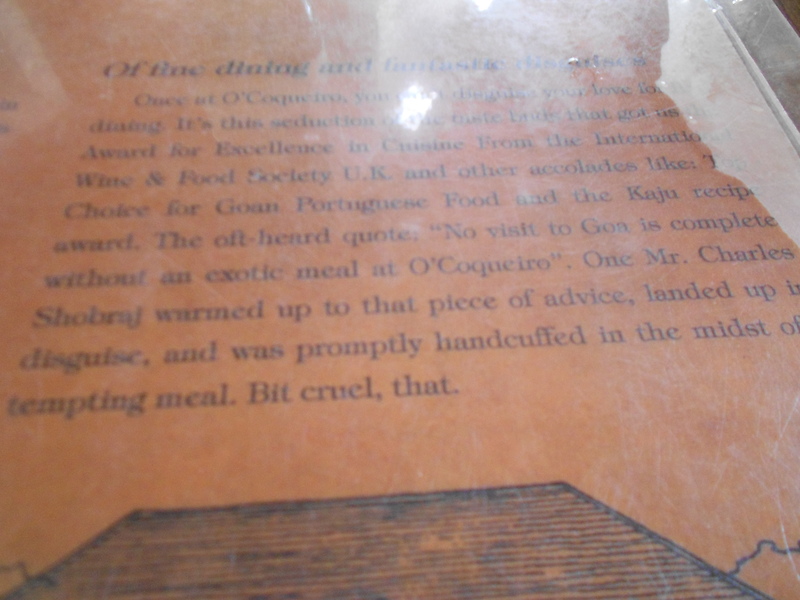 Another interesting thing was that there were three chicken curries on the table which were all very distinct in taste. I preferred the fish over the meat though. 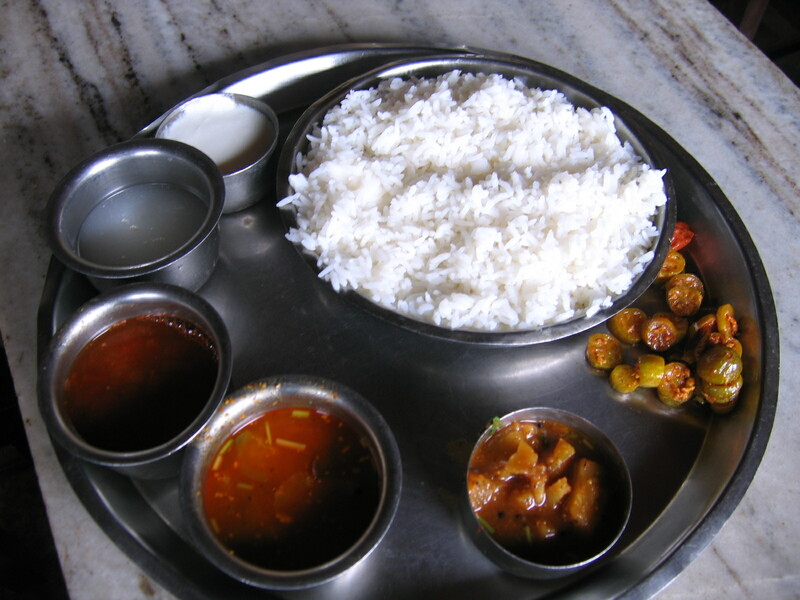 Our meal cost about Rs 1500. 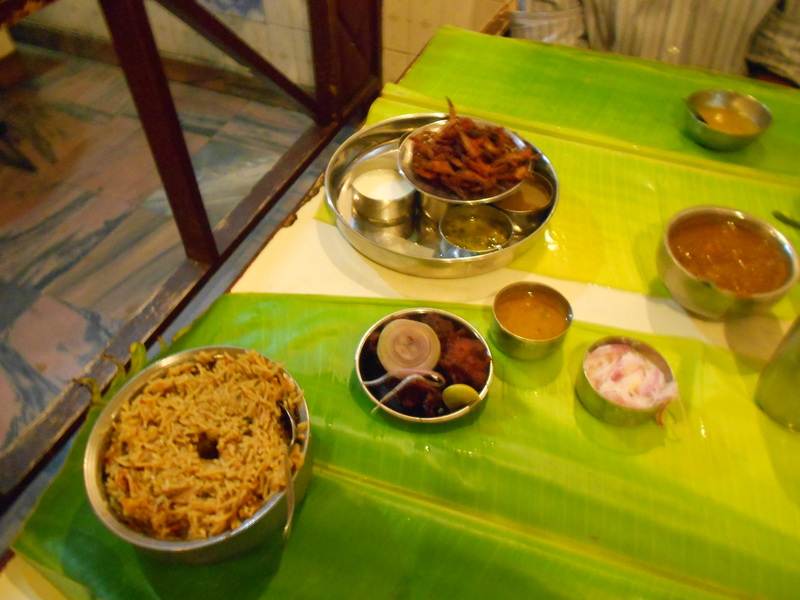 The following day, we lunched at Mudaliars Arcot Kitchen in Mylapore. This is basically a joint that operates out of a home and serves home style food. We went with their recommendation and ordered the Picchi Potta Chicken (shredded chicken with spices), Sankara Fish Curry, Fish Fry, Arcot Special Chicken, and 2 plates of rice. 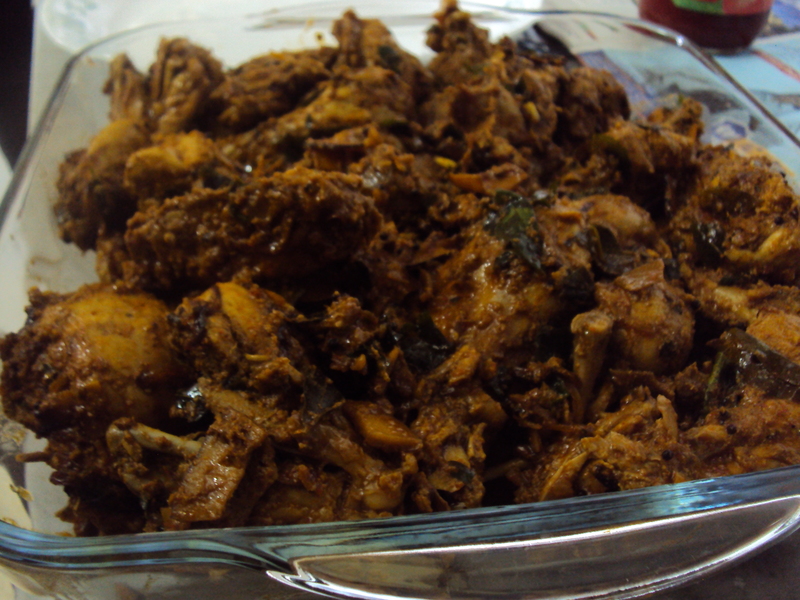 The picchi potta chicken was outstanding and went very well with rasam and rice. 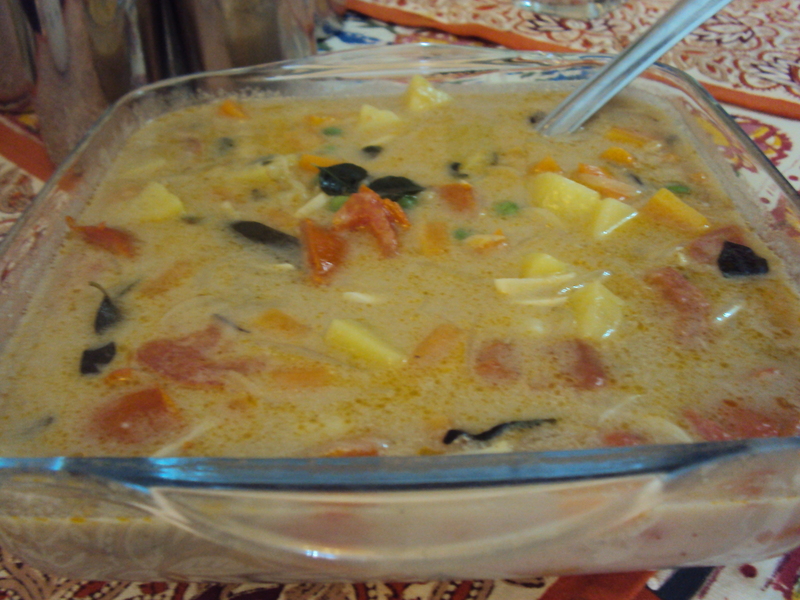 The fish curry tasted exactly like the one Amma makes. Mahesh wiped it clean. 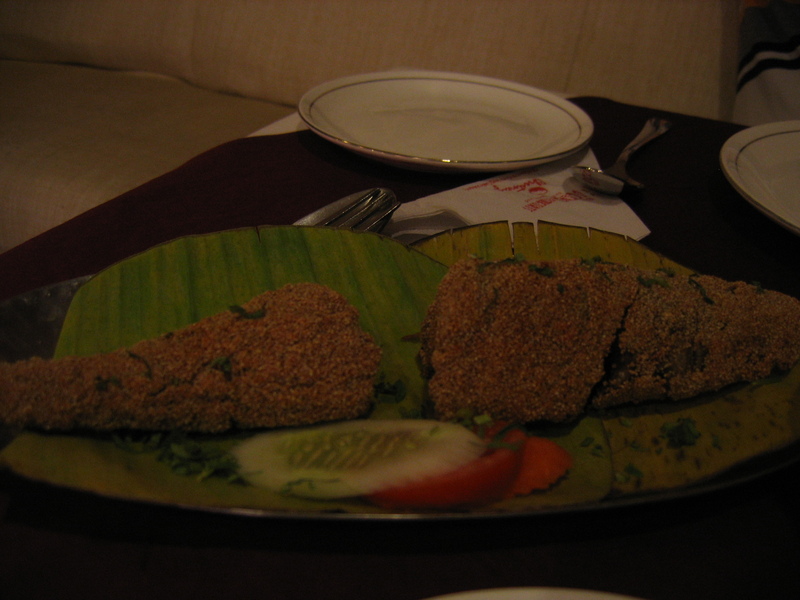 The fish fry was average and there was nothing special about Arcot Chicken. It was Chinmil (Chinese + Tamil?) dish and we struggled to finish it. 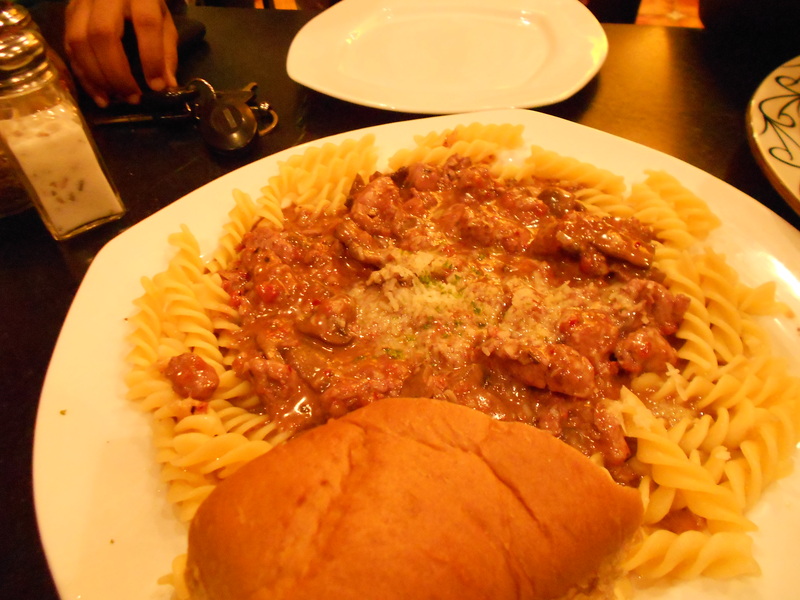 Our meal cost us Rs 595 and was more than worth it. We also caught a glimpse of Amma while entering the Marina beach. There were cops on the road and traffic had been halted. We knew it had to be her. We waited barely for a minute and there she was – in the front seat of her SUV with her hands folded. 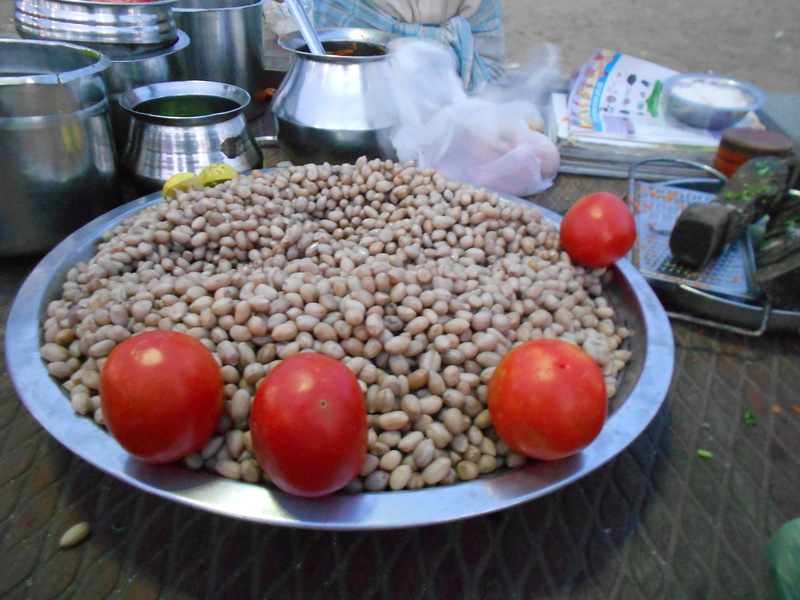 At the beach, we chomped on my second favourite beach snack – steamed peanuts. We also saw a mobile van by the State Fisheries Department serving seafood. Very very tempting. But, we decided to leave it for next time. Our last stop in Chennai was Buhari Hotel in T Nagar. It has been around since 1951 and claims to have invented the legendary Chicken 65. Their menu also features a “Chicken 90” and “Chicken 2010”. 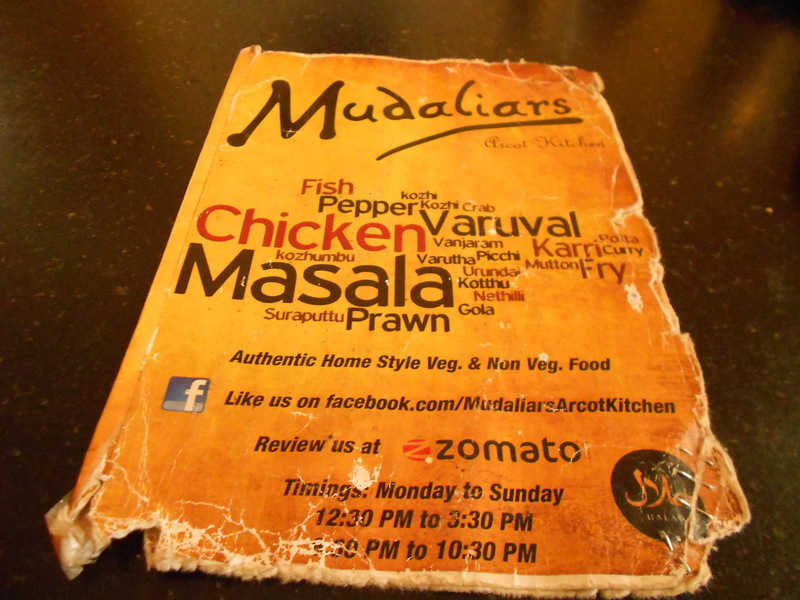 We were still recovering from our lunch at Mudaliars. 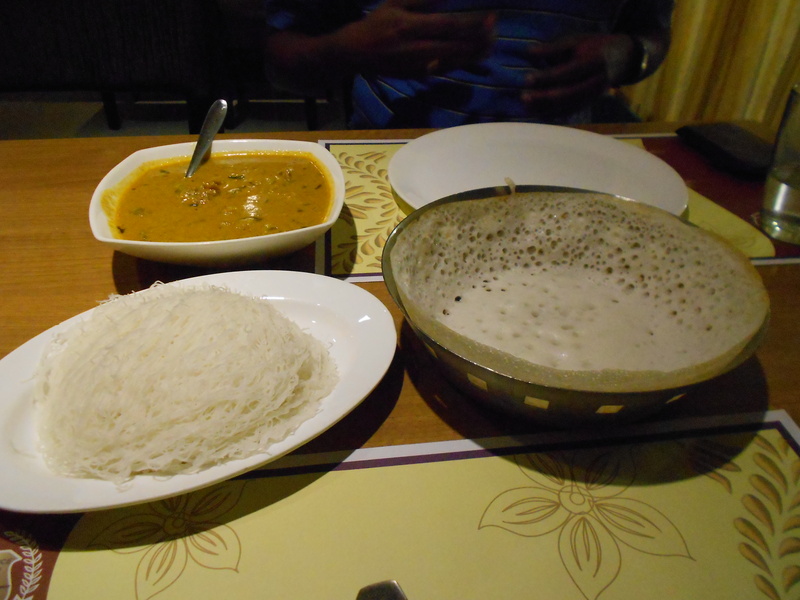 I ordered a Mutton Pepper Soup and Mahesh ordered for an appam, idiappams, and paya. 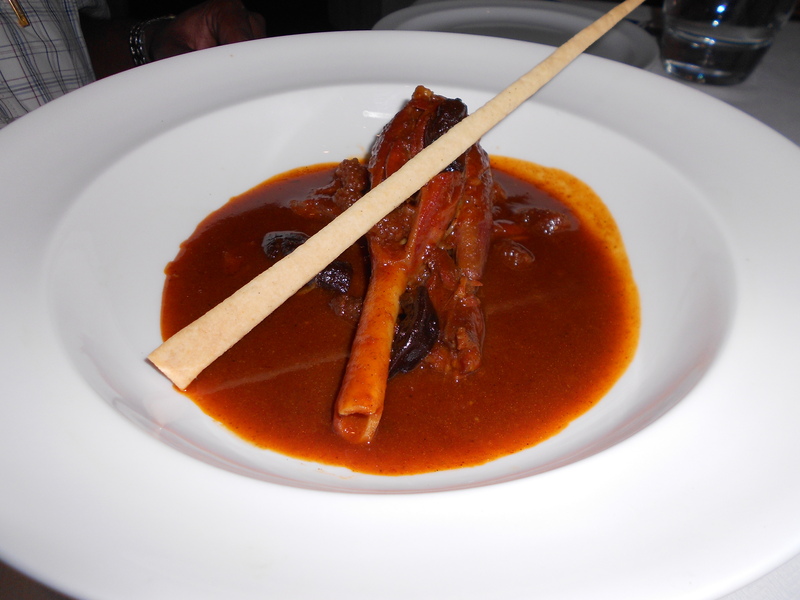 The paya was outstanding – the trotters were soft and the curry hit all the right notes. 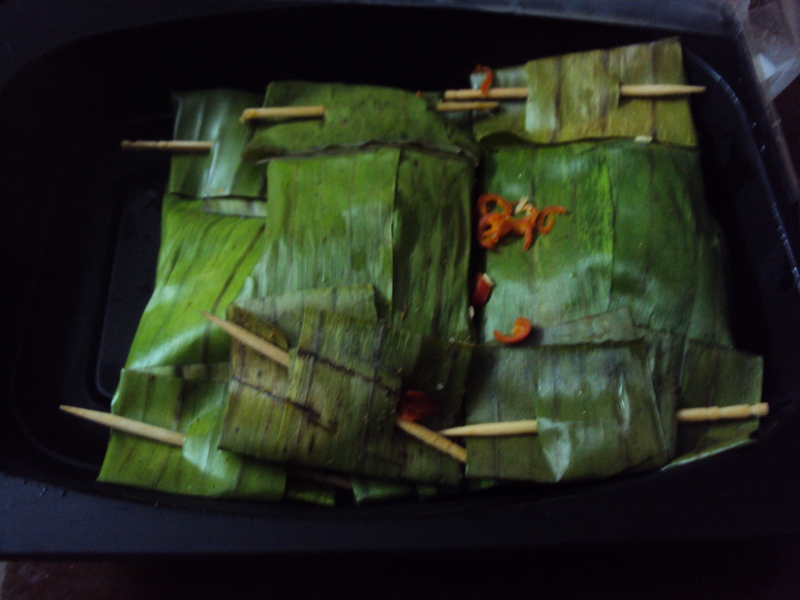 It was sour and spicy and went well with the idiappams. All this along with a bottle of water cost us Rs 350! I haven’t felt inspired enough to update the blog in a long time. That doesn’t mean I haven’t done my fair share of eating or cooking. I’ve tried three types of Ambur Biryani, eaten goat head (not brain) fry, made mini chocolate croissants, and some more. The microwave at home stopped working three weeks ago. All my baking (yes, I bake in a micro with conve(i)ction) has come to a halt. I am itching to bake something. Is it time for a new micro? 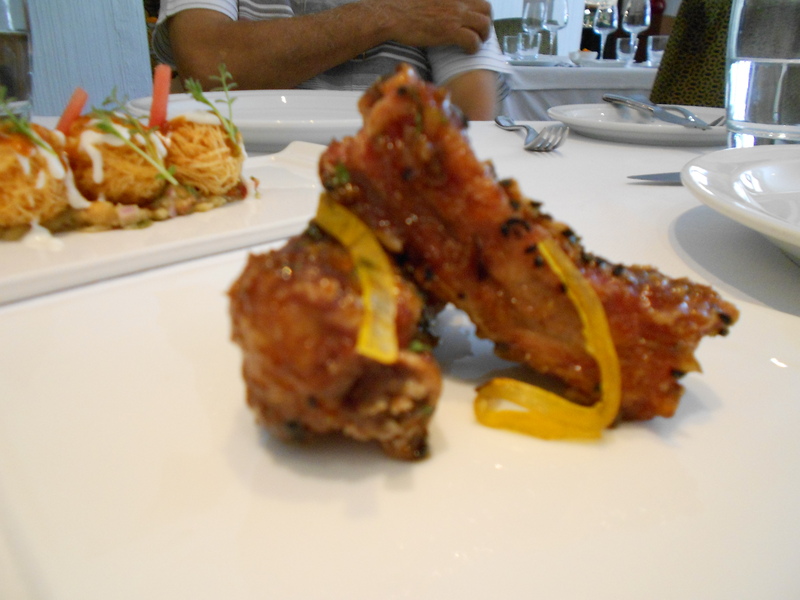 Meanwhile, here’s my experience at Caperberry which is touted as one among Bangalore’s best restaurants. 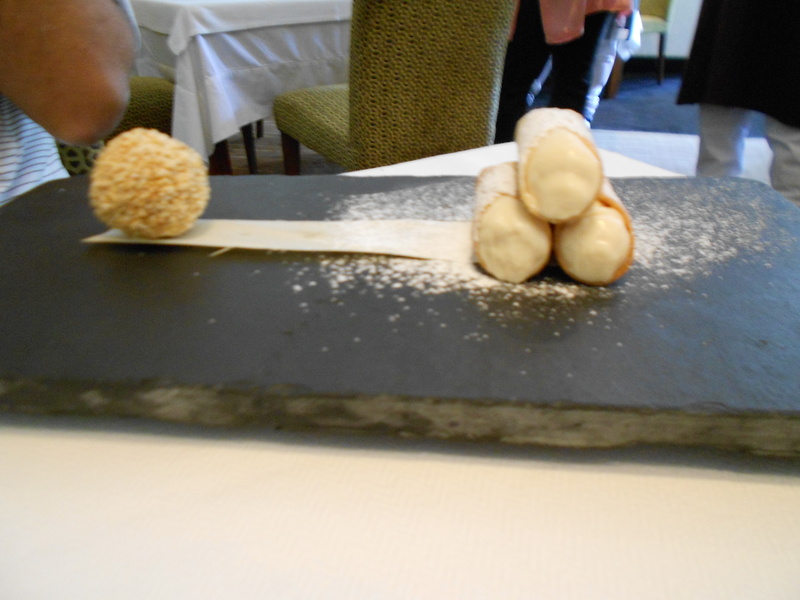 We had the three course fixed menu at Caperberry as part of Times Gourmet Week over a month ago. The meal kicked off with a tangy beetroot gazpacho, freshly baked bread, and creamy basil pesto. The pesto was addictive. We then had the poached chicken sou vide salad with orange and the duet of parsley crumbed calamari rings and paprika and cumin grilled chicken. The salad was light, crunchy, and full of flavour. The citrus of the orange segments worked wonders. 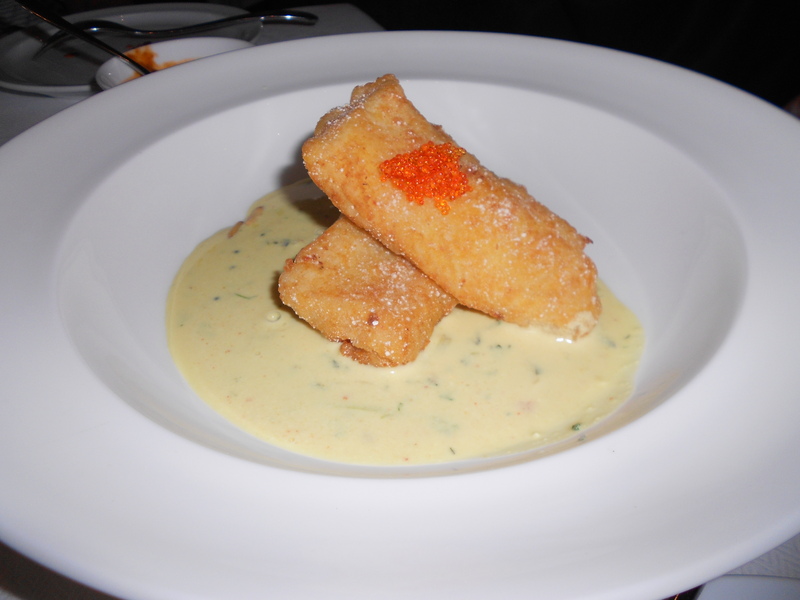 The calamari rings were spectacular – it was almost like biting into butter. The cumin grilled chicken paled in view of the other two dishes. It was decent but not as yummy as the calamari. For mains, we had Picada Grilled Halibut and the Chicken Risotto. I was quite let down with the Risotto. 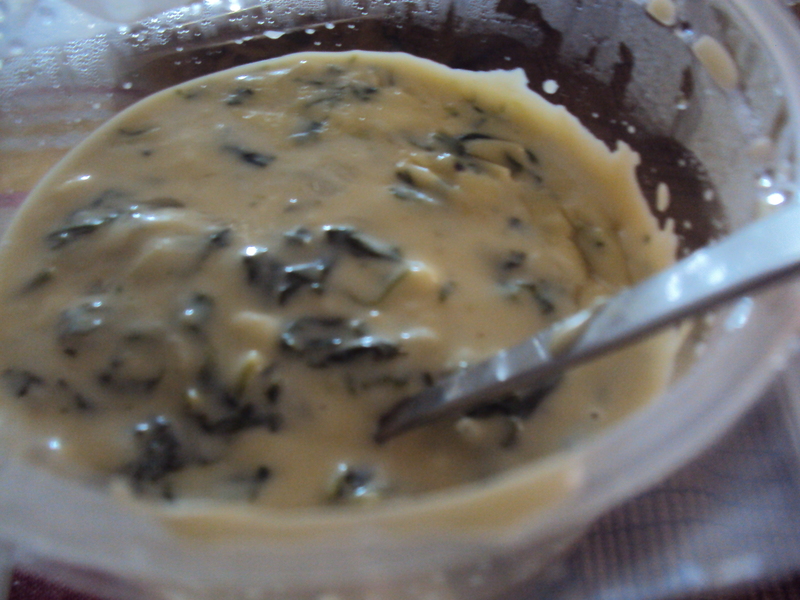 The chicken stock that must have been used to make the risotto completely overpowered the dish. I wish some parsley had been added to mask the overwhlemingly chickeny flavour of the fish. The fish on the other hand was chunky almost meaty and went really well with the mixed beans. It was beautifully plates as well. 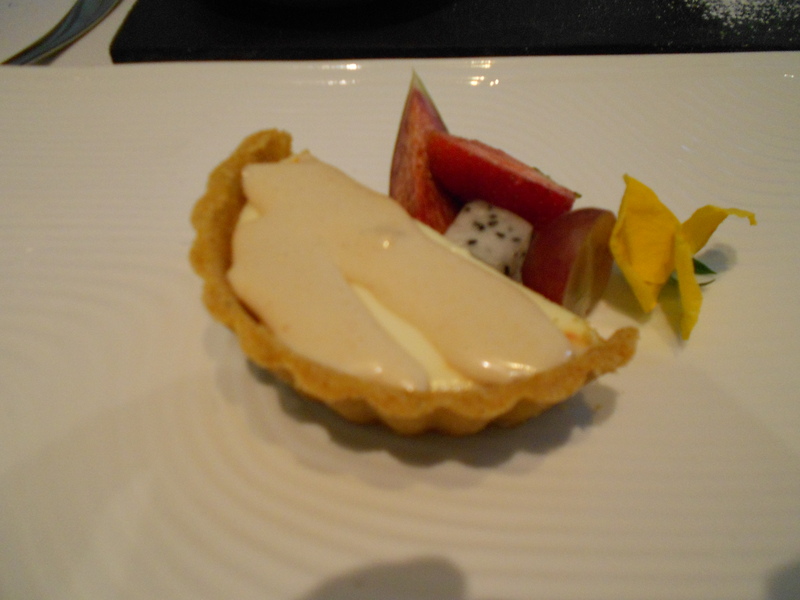 For dessert we had mango mousse, coconut jelly, toasted coconut, candied rose petal and churros. The mousse was gelatinous and the candied rose petals were not fragrant at all. This was quite a dissapointing dessert. 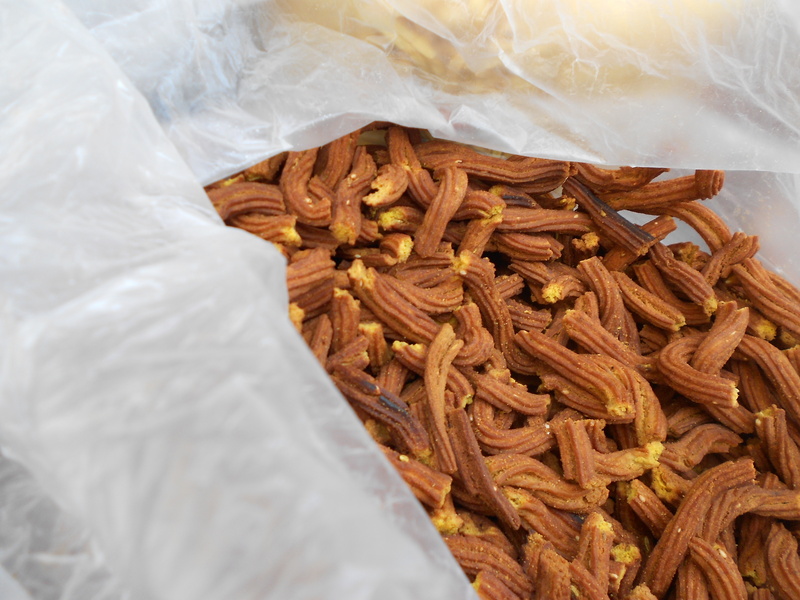 The churros and the warm chocolate on the other hand were very nice. The meal ended with a yummy little tiny raspberry tart. 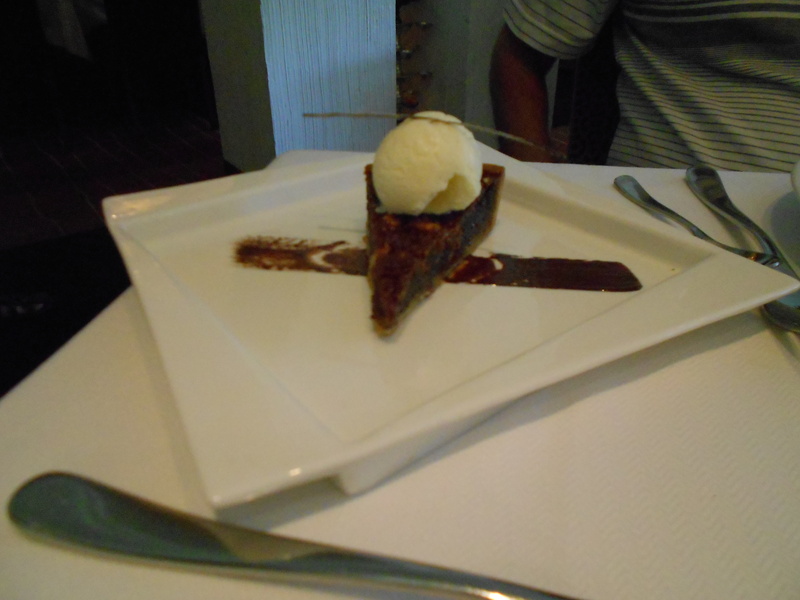 While on the whole I enjoyed the meal this was nowhere close to my experience at Indian Accent or Olive in New Delhi. Priced at Rs 750 per head plus taxes, this meal was definitely value for money. Out of the blue, a day’s work came up in Mangalore. I had been dropping unsubtle hints of not having had a holiday in over 2 years for a LONG while. Mahesh decided that a short trip to Mangalore could easily be organised and so booked his tickets and a hotel immediately without informing me. Till the last minute though we were not sure if the holiday would happen as Mahesh was expecting to be called away to Chennai on work. Thankfully, that did not happen and the two of us along with 5 of my colleagues boarded the Kannur/Karwar Express on a Wednesday evening. We realised that the Kannur and Karwar Express was just one train with two names because of the end destinations. Mahesh booked on Kannur and then cancelled his ticket and booked on Karwar when he found out that we were booked on Karwar. At the station, we realised it was the same train! 7. Ice cream at Pabbas or Ideal Ice Cream on Market road. I also managed to watch the Highway on my Plate episode on youtube and added The Woodlands Hotel and Kori Rotti to my list. My first meal in Bangalore was at the canteen of the institute where our programme was being held. 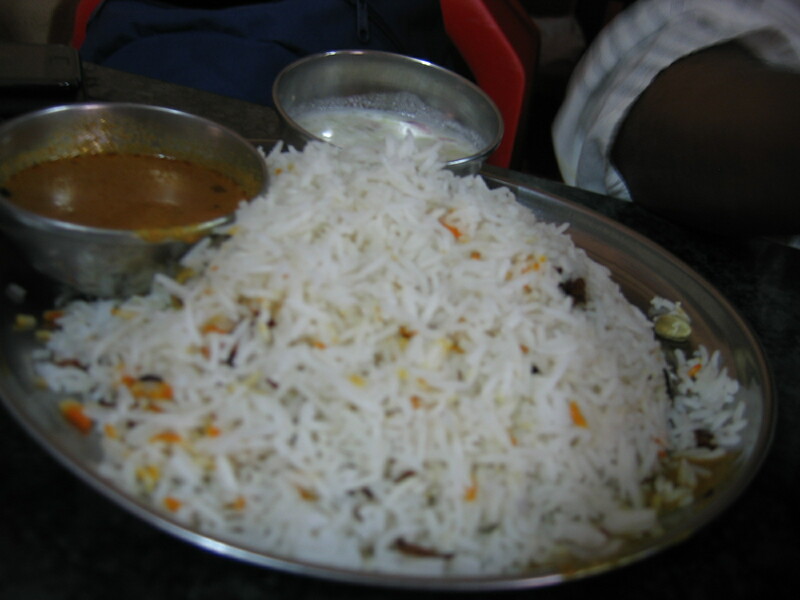 Our options were a deep fried bun or vegetable pulao. Not wanting to have a pulao in the morning, I picked the bun. 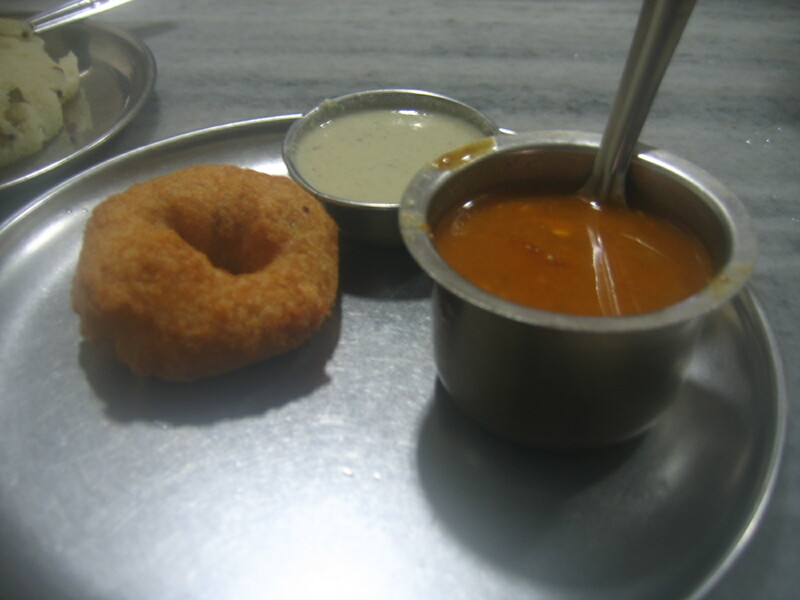 It is basically a Mangalorean doughnut made from flour and bananas and is served with a coconut chutney. The bun was very soft and light, but I could not detect the banana. 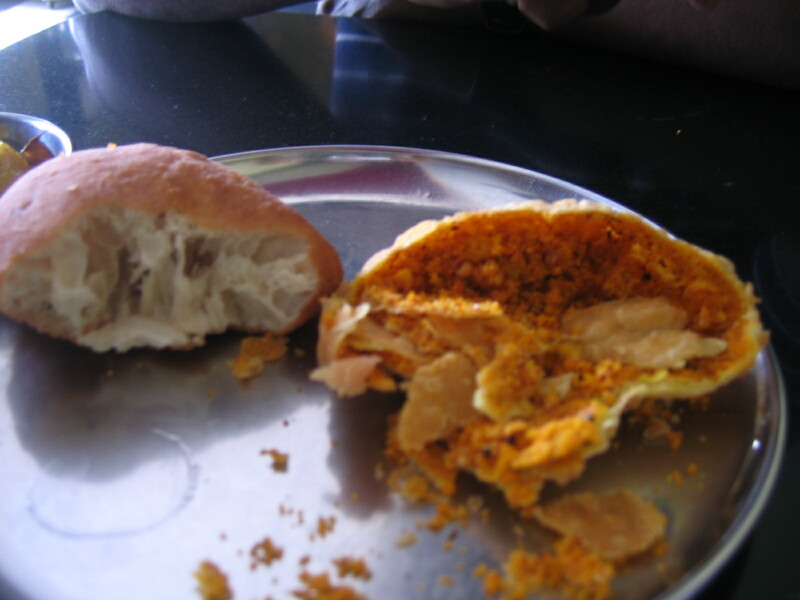 My first bite in Mangalore was this doughnuty “bun”. 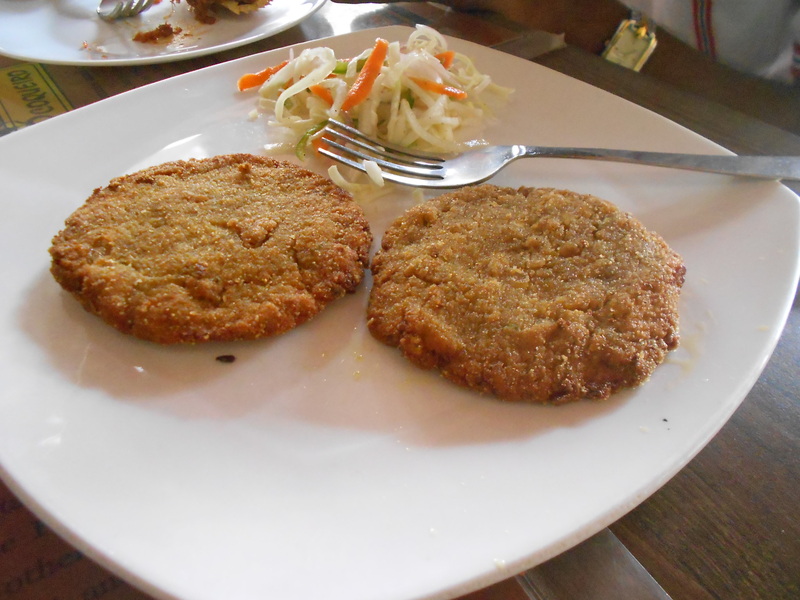 Deep fried, soft, sweet, and delicious when had with coconut chutney. 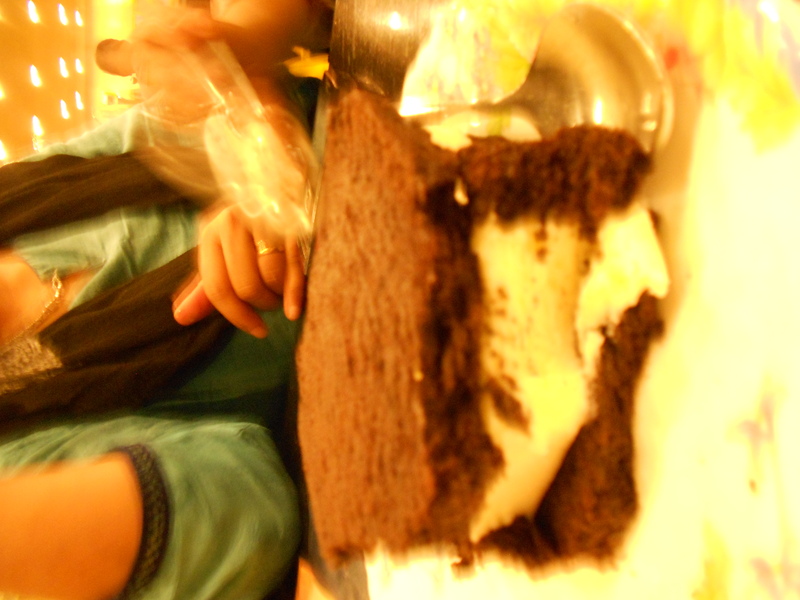 After work got over, Mahesh joined all of us at Ideal’s for ice-cream. There was a lot of gadbad as there happened to be 3 Ideal outlets in the same location. Some of my colleagues went to the two other outlets before landing at the one where the rest of us were waiting. As a result of all the waiting, we ended up trying quite a few sundaes. 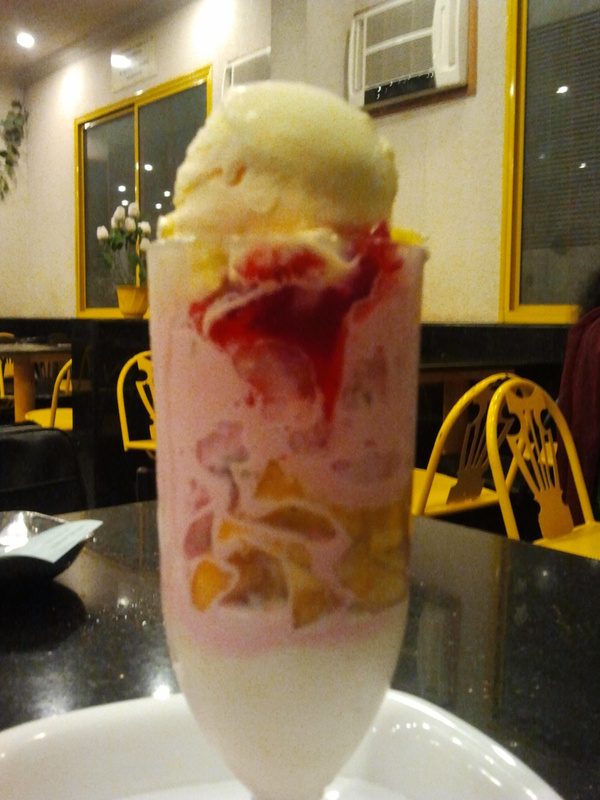 The icecreams here reminded me of my childhood – combos of vanilla and strawberry, fruits, and jelly that all comes together quite simply without any jazz. 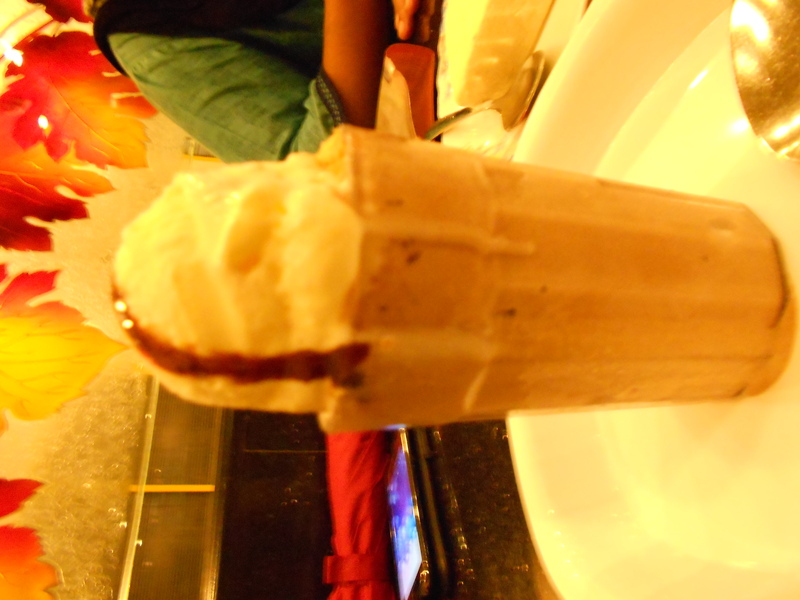 Chocolate Dad @ Ideal’s – crunchy, chocolatey, and just Rs 70! Cake Sandwich – the cake was dry and not that great. Post dessert, we headed to Coral @ Ocean Pearl for dinner. We ordered Squid Ghee Roast and Kori Roti. 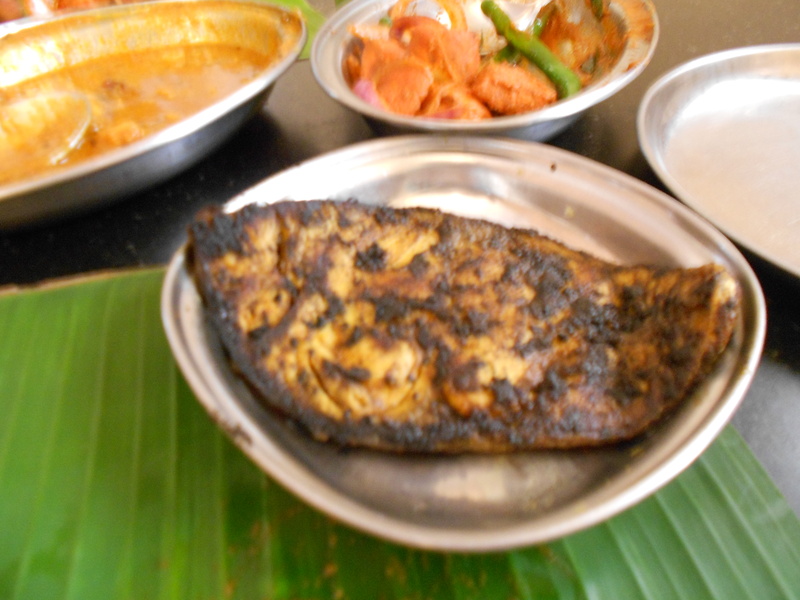 To our dismay, the squid ghee roast was bitter. We immediately sent it back and asked for a Kane Masala Fry instead. Later, the chef conveyed to us that the dish was bitter owing to the chillies used. The outstanding kori roti and the kane fry made up for it. 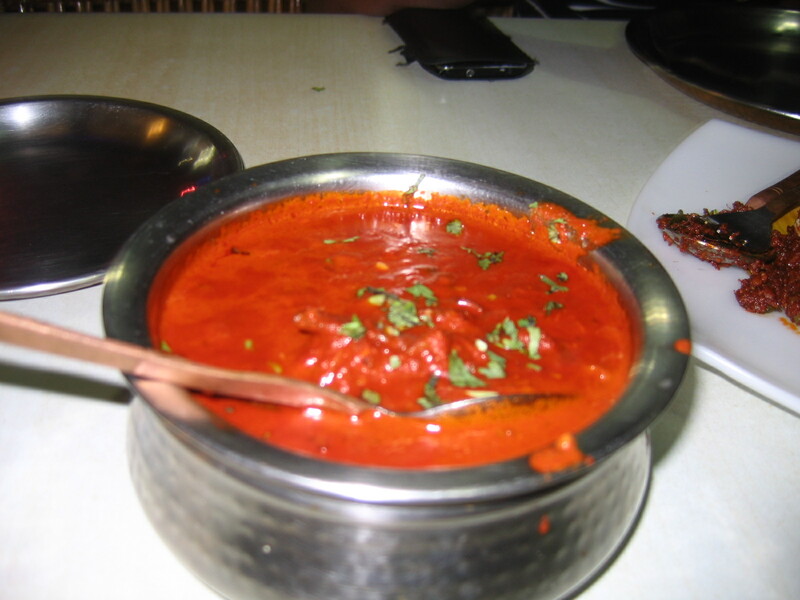 The chicken curry was rich and redolent with spices without being too spicy. 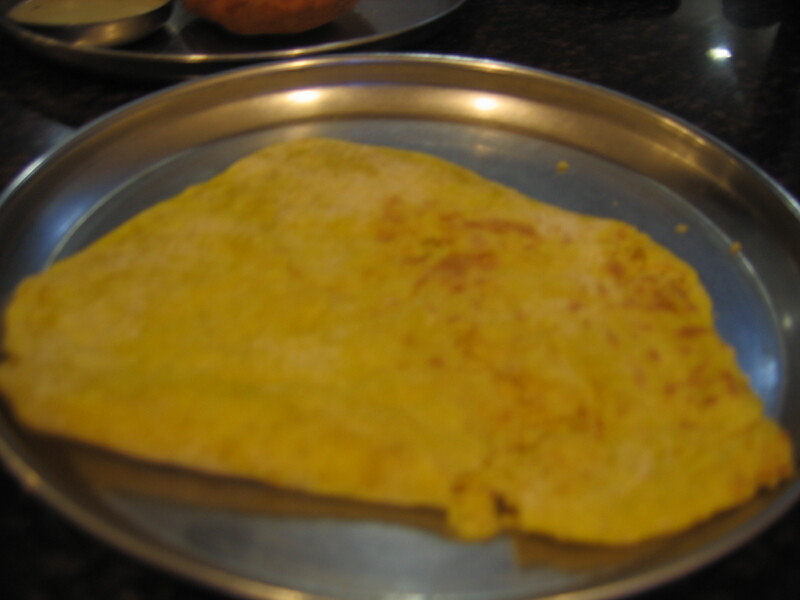 The kori roti is an amazing dish- the crunchy roti when combined with the cream curry produces a beautiful texture. 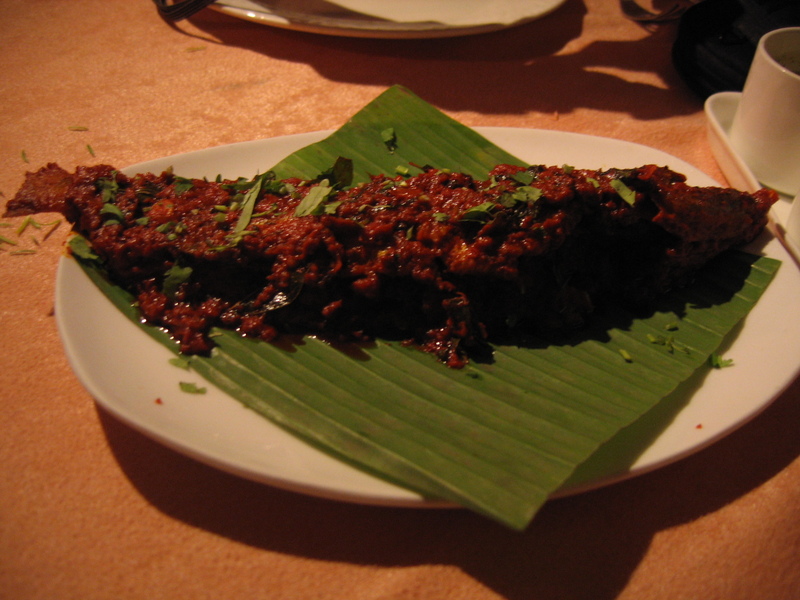 Bitter Squid Ghee Roast @ Coral, Ocean Pearl. At the dinner table we planned the rest our meals. With sheepish grins, we also decided to throw in some sights – after all we needed to do something in between meals. 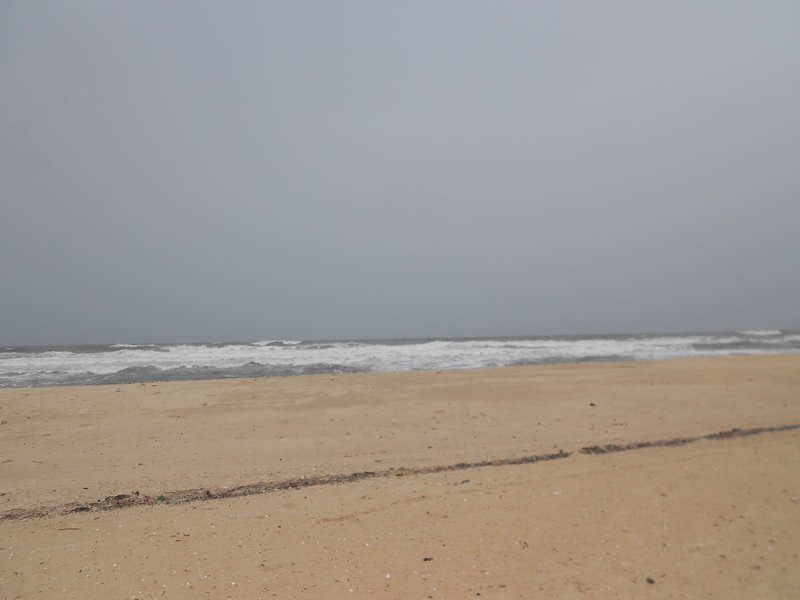 The hotel staff told us that all beaches were closed due to the rains. We headed to Sultan Bateri the next morning and were delighted to see a ferry operating there. We jumped on to it without knowing what lay on the other side. Imagine our excitement when we learnt that there was a beach on the other side – Tannirbhavi Beach – which was open. We made our way towards the beach while other couples who were visibly very young and very touchy-feely headed towards the bushes and trees. The beach was absolutely empty. We spent a very happy one hour there – standing in the water, sitting on a branch and watching the sea. Beach done, we headed to the non-vegetarian restaurant at Deepa Comforts. This was the most expensive as well as heavy meal of our entire trip. It cost us about Rs 1100. 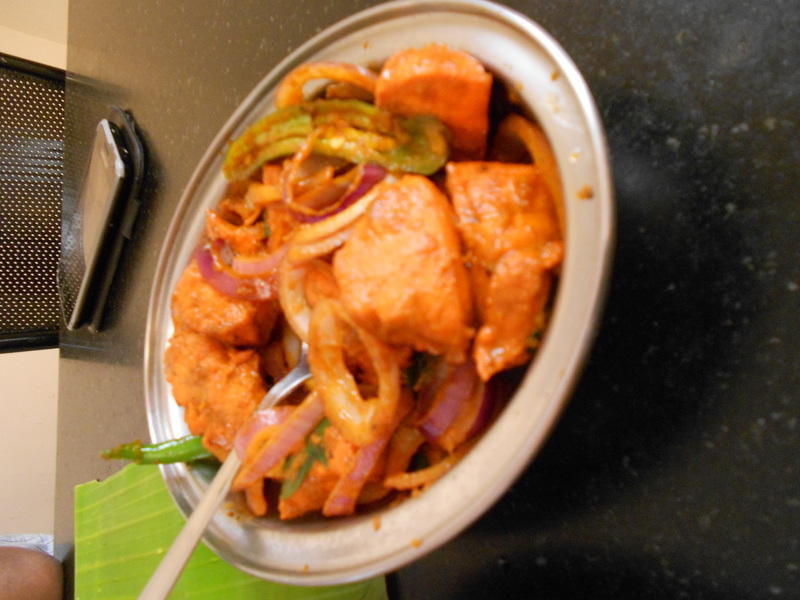 We started with a Chicken Urval – a yummy spicy chicken fry with lots of onions and chillies. This was followed by a Kane Rawa Fry which was okay okay. 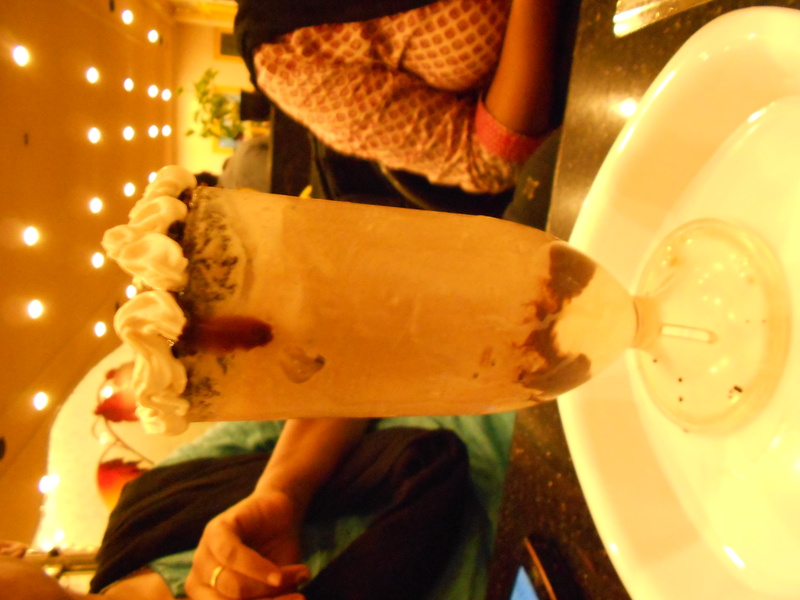 When the bill came we were shocked to see that this cost Rs 400. Kane Rawa Fry that cost us Rs 400. 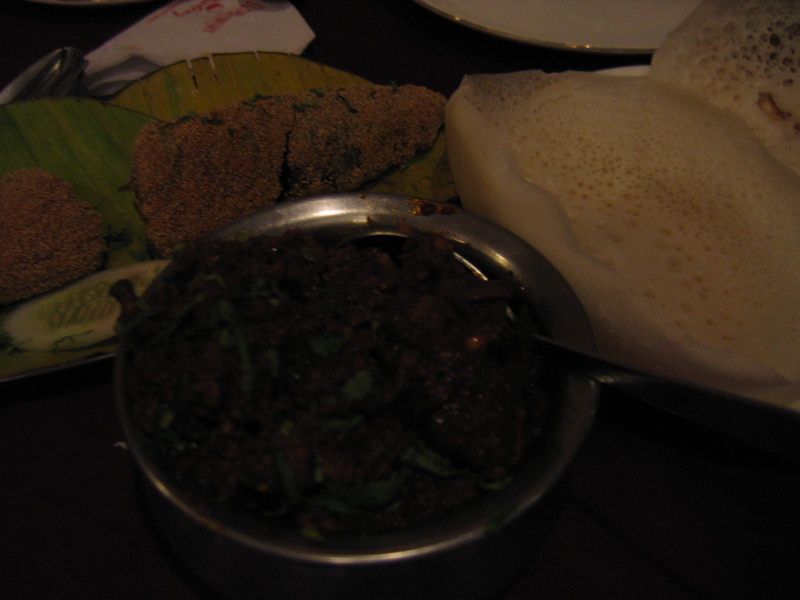 We also had a mutton sukka with neer dosas and appams. 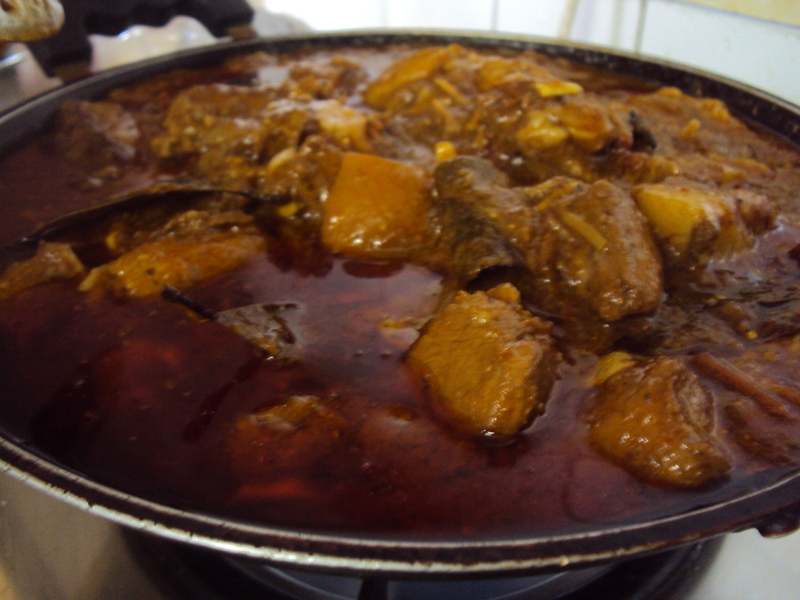 The mutton literally melt in our mouths. We were so stuffed at the end of this meal that we skipped dinner! Criminal na, considering we had so many restaurants to go to. But, we needed to give our stomach a break from the heavy Managlorean fare that we had been gorging on. 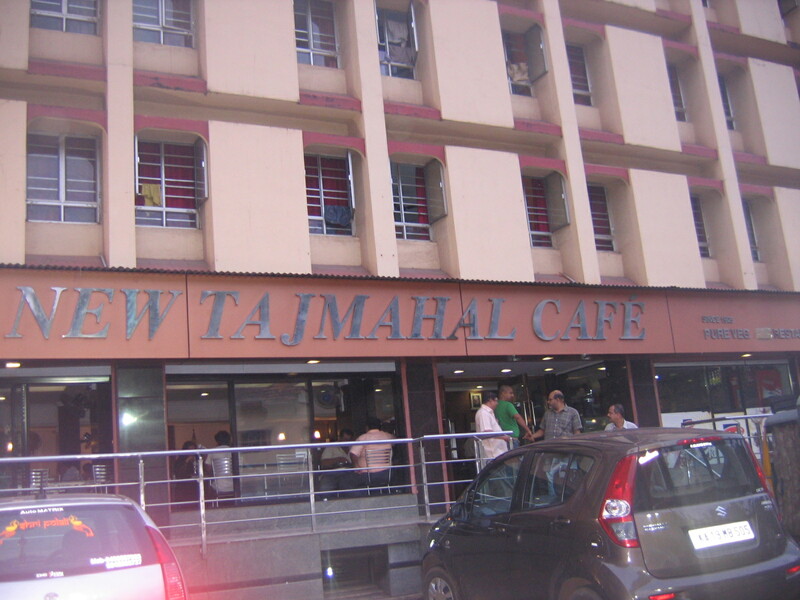 Despite the claims of a heavy lunch, we ended up at The New Taj Mahal Cafe for coffee. By the time we got here the goli bhajis were over. We settled for a coconut poli, bun, and a jackfruit special. We did not particularly like anything that we ordered here. Coffee at New Taj Mahal Cafe. 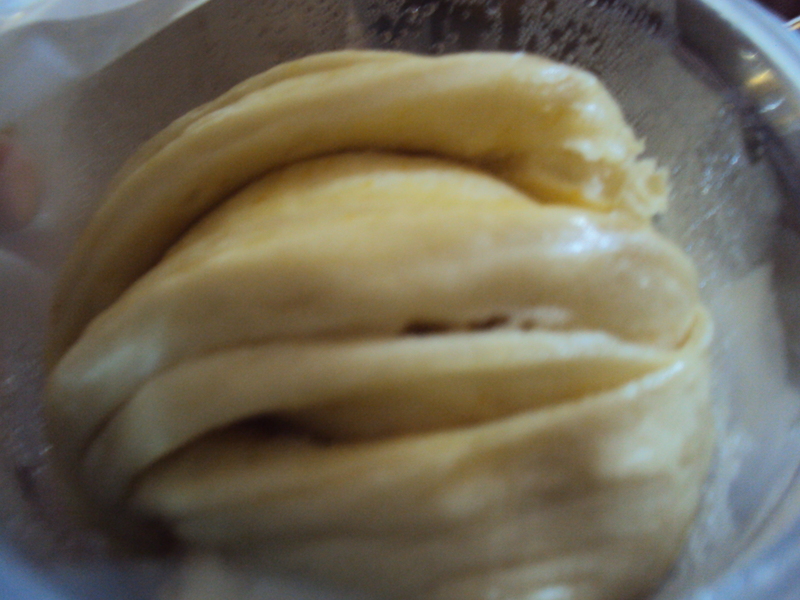 Steamed Jackfruit Sweet – was too dry for my liking. when I spotted raw mangoes at the entrance. This is such a common sight at beaches in the South. We then headed to the Krishna Temple in Udupi. Darshan done, we decided to go to Mitra Samaj. 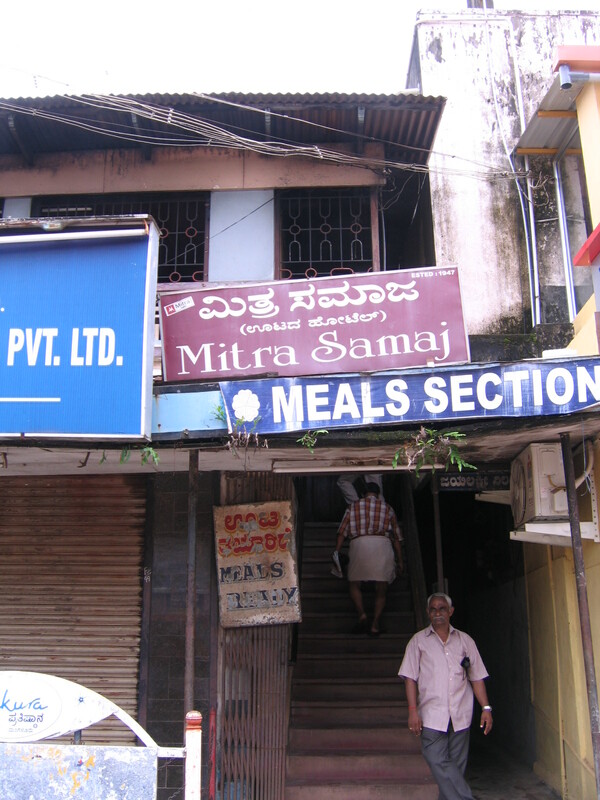 I had chanced upon this article while googling about food in Udupi – http://www.rediff.com/money/report/udipi/20040427.htm Mitra Samaj is a stone’s throw from the temple. 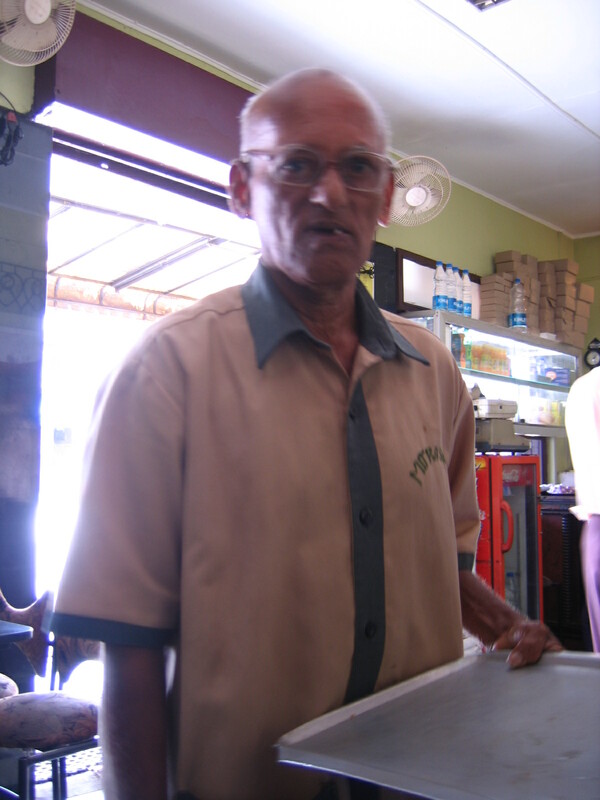 We first headed to the tiffins outlet and were greeted by 68-year-old Narayan Rao who told us that if we wanted meals we would have to head to the Mitra Samaj on the opp side and if we wanted North-Indian fare to Woodlands down the road. We decided to go to Mitra Samaj for meals. I have to admit that I was quite hesitant after I saw the exterior. Thankfully, Mahesh decided that we would have our lunch here and so we made our way up the stairs and seated ourselves on plain benches. The meal we had here was the highlight of our entire trip. 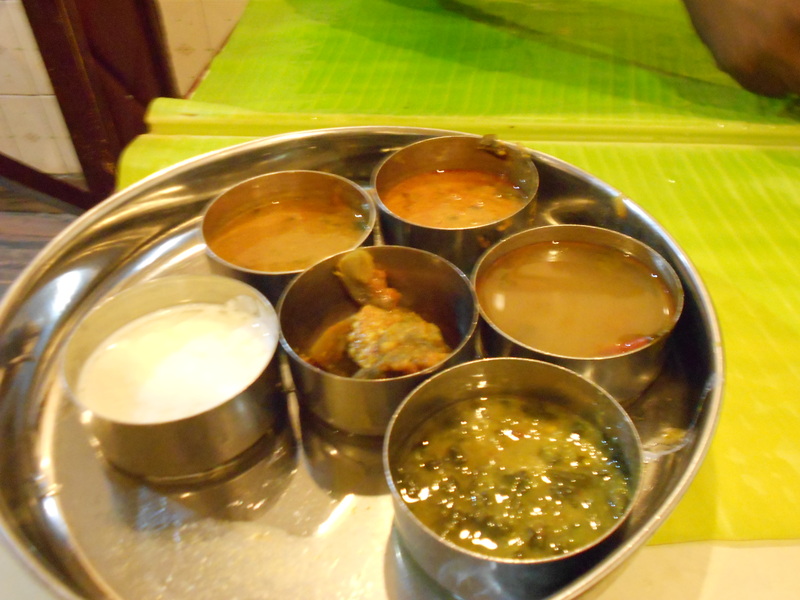 Priced at Rs 25 per thali, it was also our cheapest meal. 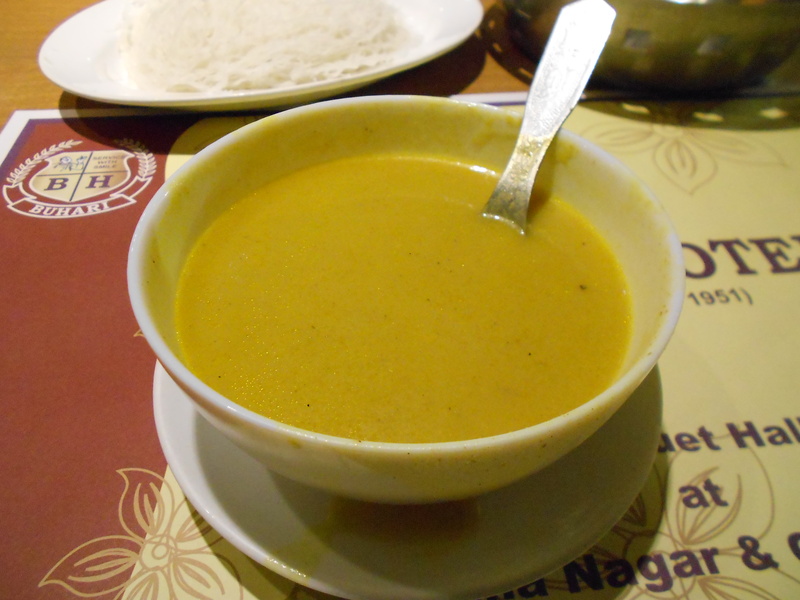 The sambhar and the pineapple curry were spectacular. 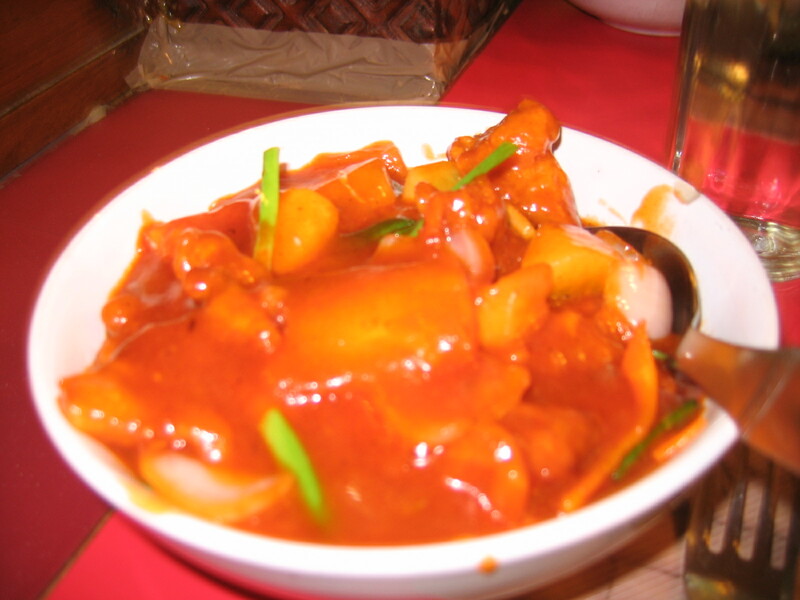 I asked for a second serving of the pineapple curry – it had the perfect balance of sweet, sour, and spice. 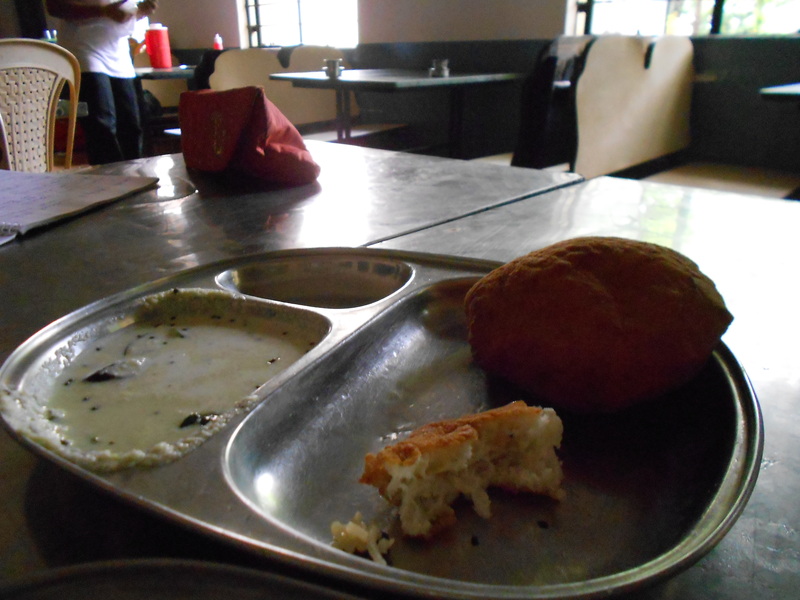 Though we were stuffed, we wanted to try the snacks at Mitra Samaj. 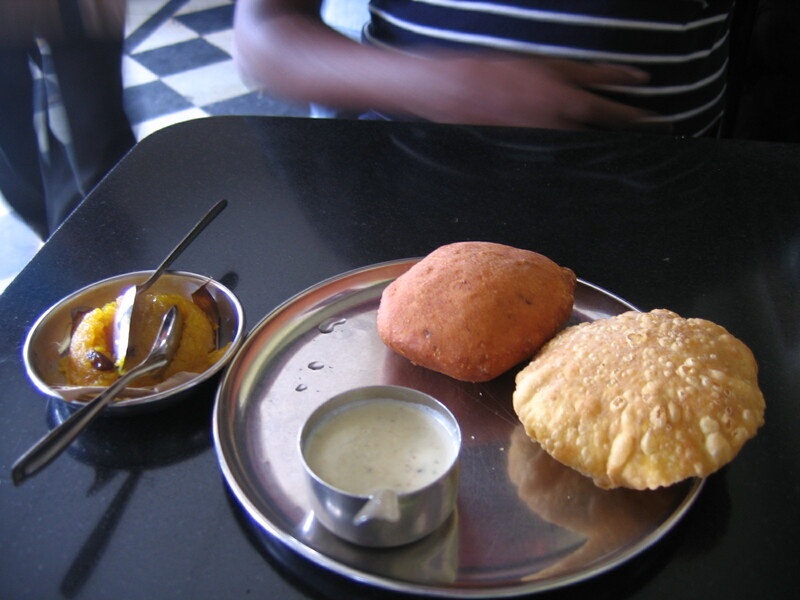 We headed back to the tiffin section and ordered a biscuit roti, bun, and kesari bhaath. Narayan Rao greeted us and served us with a lot of warmth. What we ate here was amazing – the best we had eaten so far. I could taste the banana in the bun at last! For dinner that night we went to Guthu’s. Here we ordered the chilli crab and fish pullimanchi. While the fish looked fiery, it was the crab that was super duper spicy and had me in tears. We were tired of the breakfast at the hotel and decided to head The Woodlands Hotel instead. The goli bhajji eluded us again – I was told it is served only in the evening 😦 Here we had a vada, rawa dosa, and khaara bhaath. 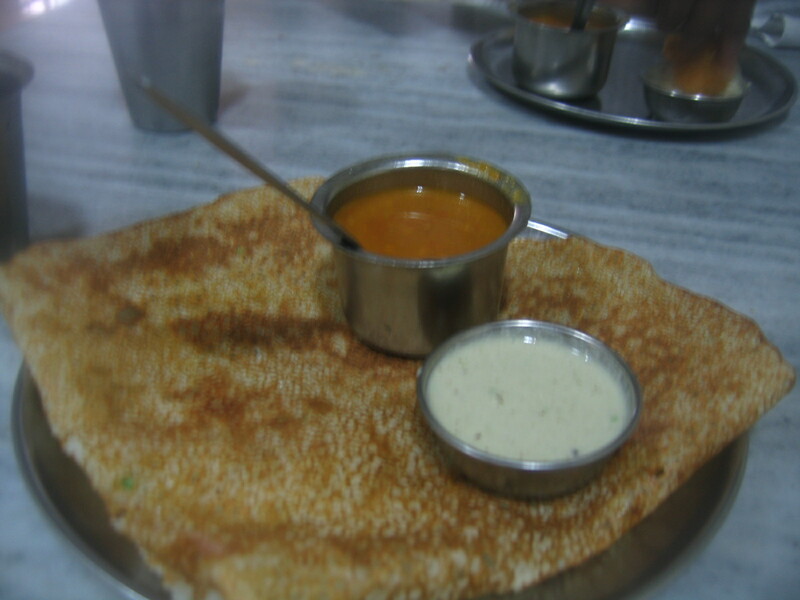 The dosa here was not half as greasy as the ones I’ve had in Bangalore. 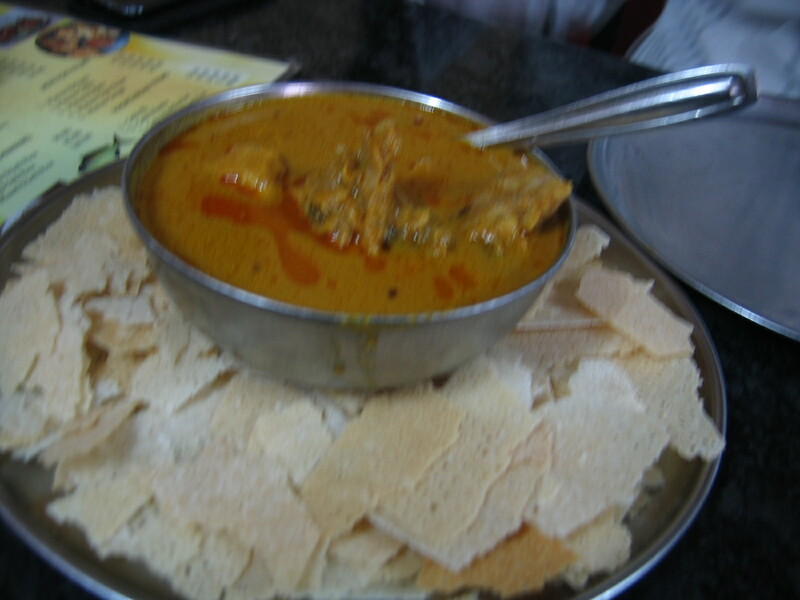 For lunch, we headed to Kori Rotti. This had been featured on Highway on My Plate. It doesn’t have much of an ambience. The emphasis I guess is on the food. We ordered a full plate of Kori Roti, Bangda Fry, and Mutton Biryani. 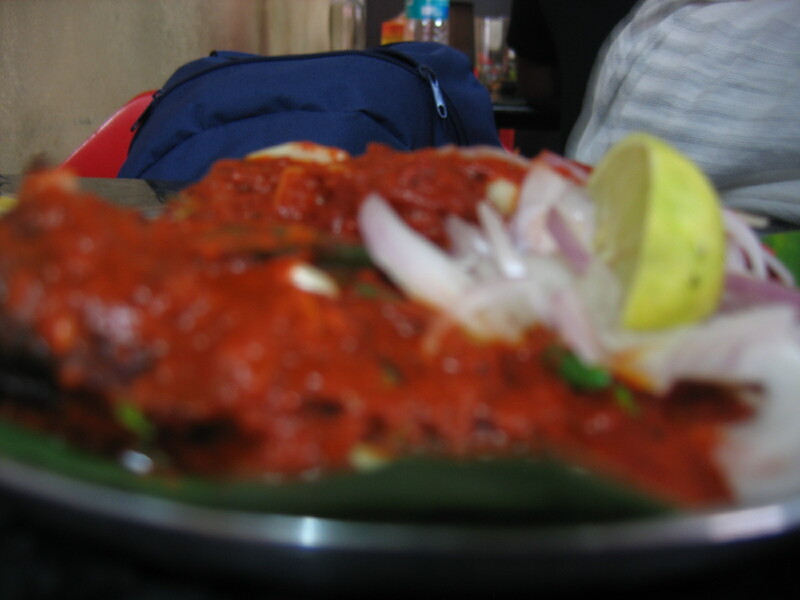 The Kori Rotti had about 8-10 pcs of chicken and was priced at Rs 90. This curry was not as heavy as the one we had at Coral. It was like a good homestyle chicken curry. The fish was decent too. It was the Biryani that was an absolute let down. The meat was rock hard. 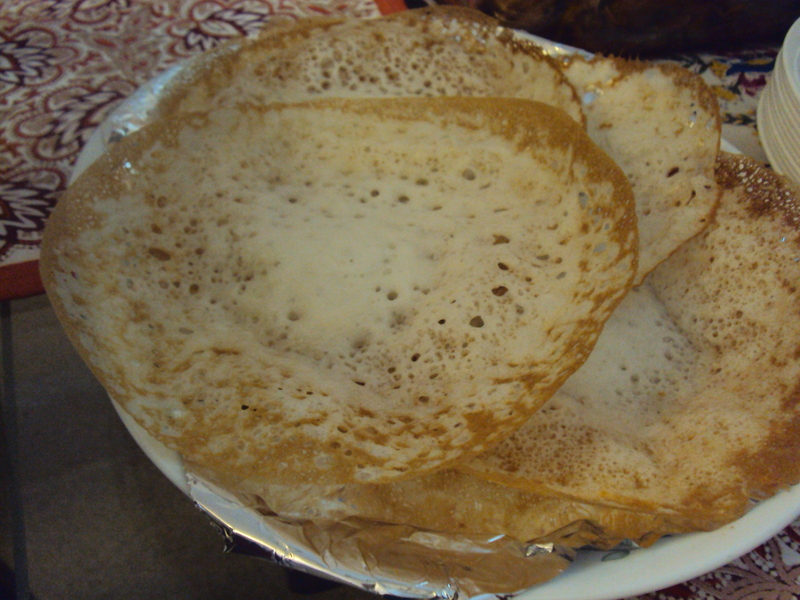 Kori Rotti that cost us Rs 90. Our last meal in Mangalore was at Hao Min, a joint that is hugely popular with college students. It reminded me of the Chinese restaurants in Kolkata that dot almost every street. Cheap and greasy Chinese food which is quite yum. We ordered salt and pepper prawns, sweet and sour pork, and a friedrice. The prawns were too salty. The pork was quite good. 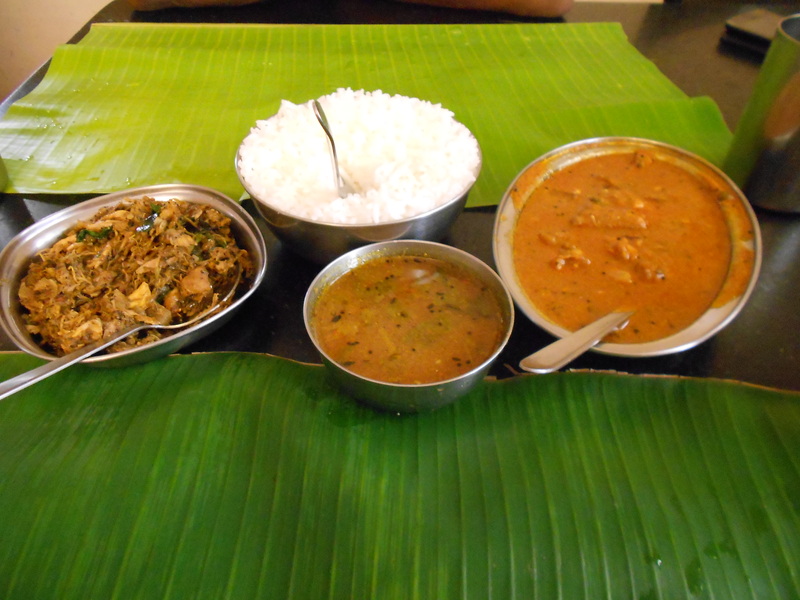 With this our food journey in Mangalore came to an end. This holiday, we realised was all about the food! In the first week of May, Mahesh and I relocated to Bangalore. I was sad to leave my parents and good friends and yet excited to set up home in a city I have grown to love. Before leaving Delhi, I had a couple of restaurants/food I wanted to eat at and managed to cover most. Interestingly, majority were places that I had been to before. 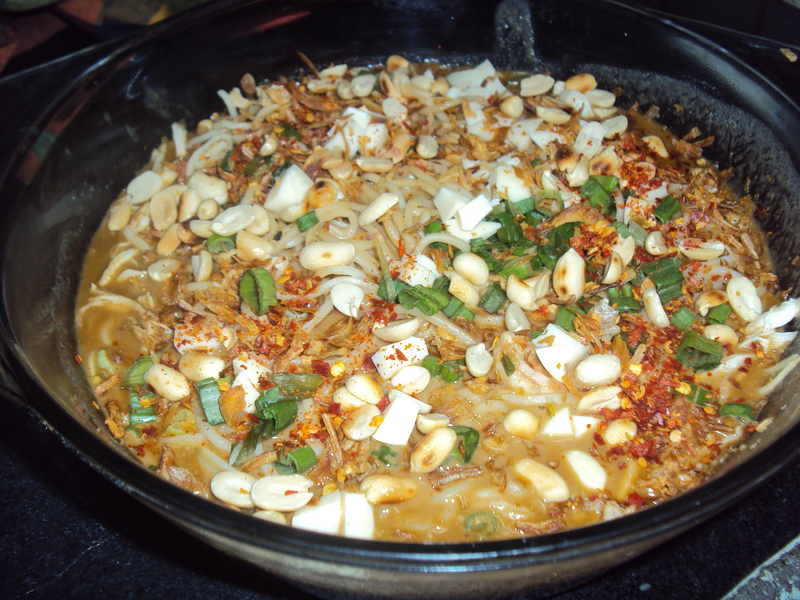 The ones I missed were Al Kauser and the Khao Suey at The Kitchen. 1. Yum Yum Tree, New Friends Colony – The dimsum and sushi buffet. I’ve blogged about their Sunday Brunch at YYT here. I LOVE the asparagus sushi (veg sushi is yum! 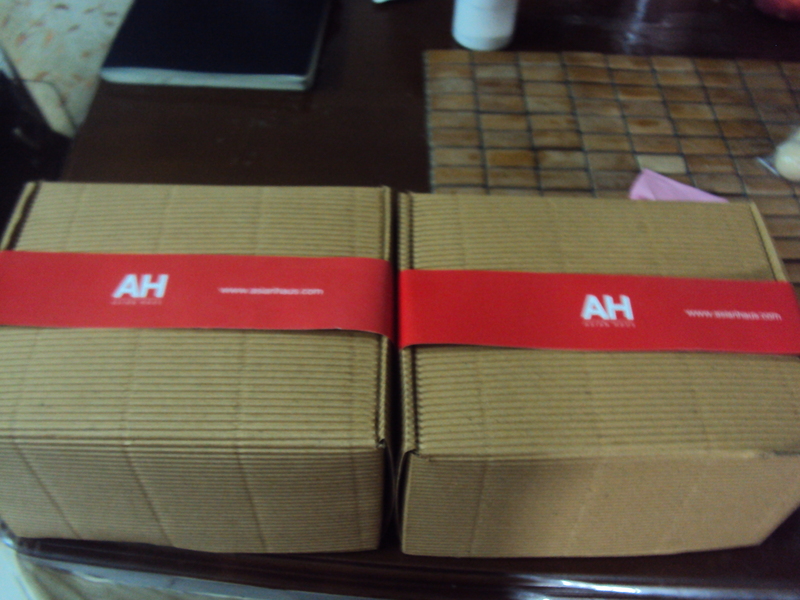 ), prawn tempura sushi, and the prawn har gao here. This was my last and best restaurant meal in Delhi. 2. 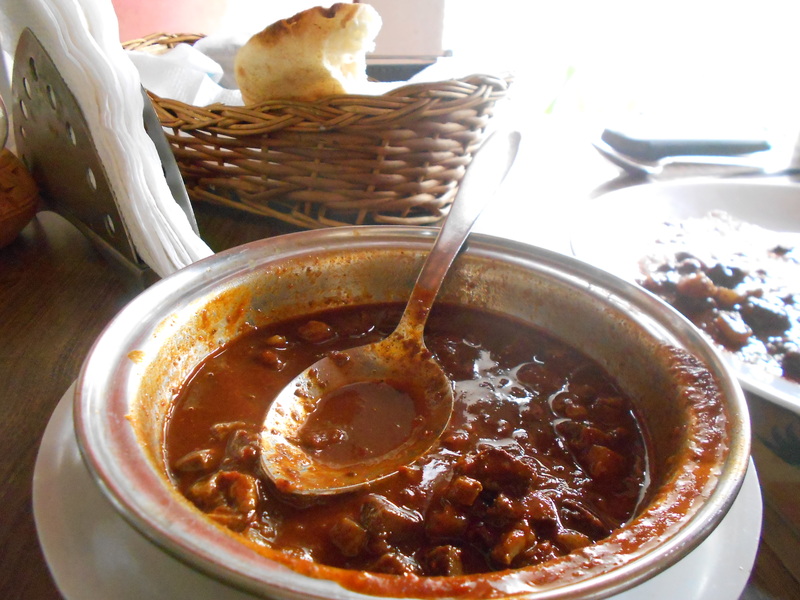 Karim’s, Old Delhi – Breakfast of nihari and paya with soft tandoori rotis. Surprisingly, the weather on the last Sunday morning in April was absolutely splendid. It made our journey to Old Delhi and back very very pleasant. 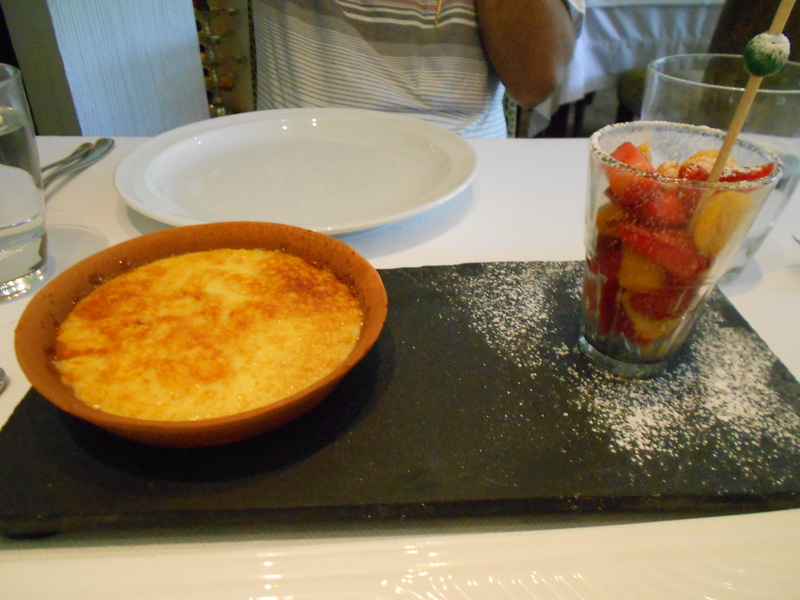 I’ve blogged about my experience at Karim’s before. 4. Indian Accent – I’ve blogged about my “experience” at Indian Accent before. Luckily, they featured again in Restaurant Week in April. This time around I went there with my parents and we loved the food. 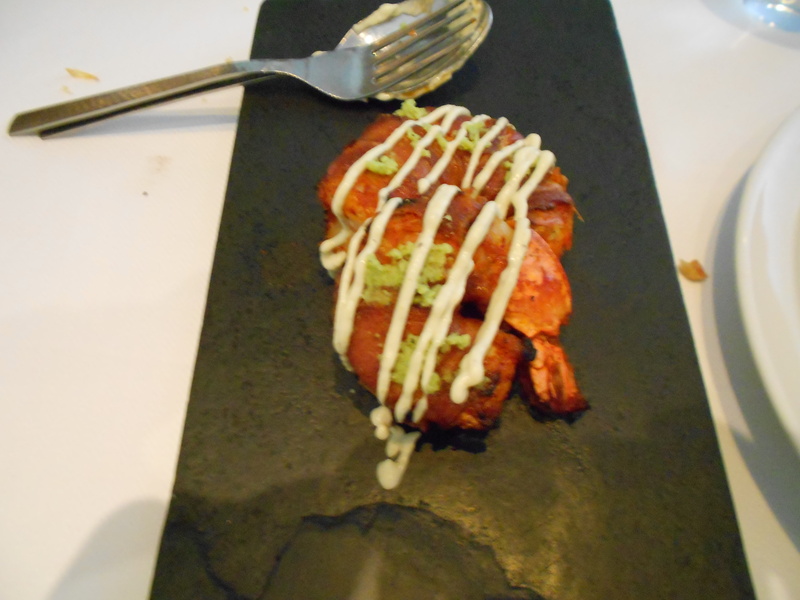 What I really enjoyed were the bacon wrapped prawns, the pao bhaji, the tender coconut creme brulee and the doda burfi tart. 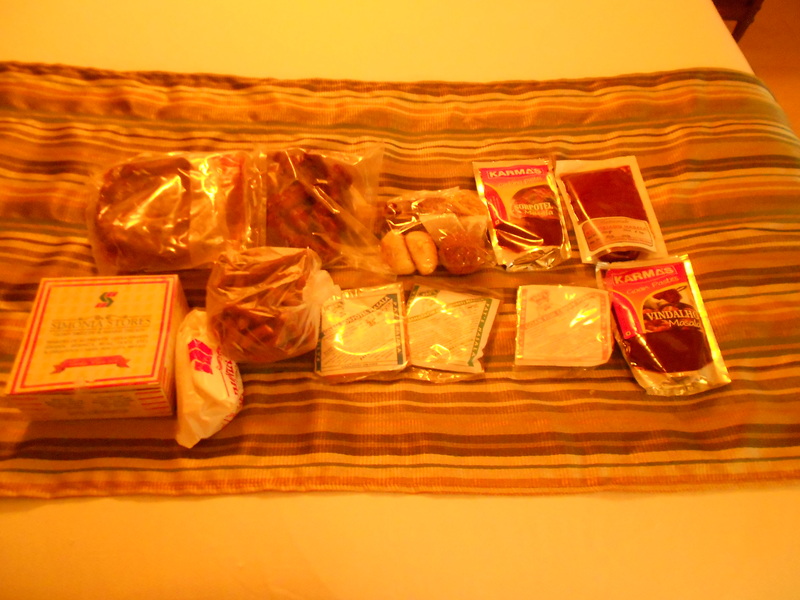 Here are the pictures of what we ate. 5. 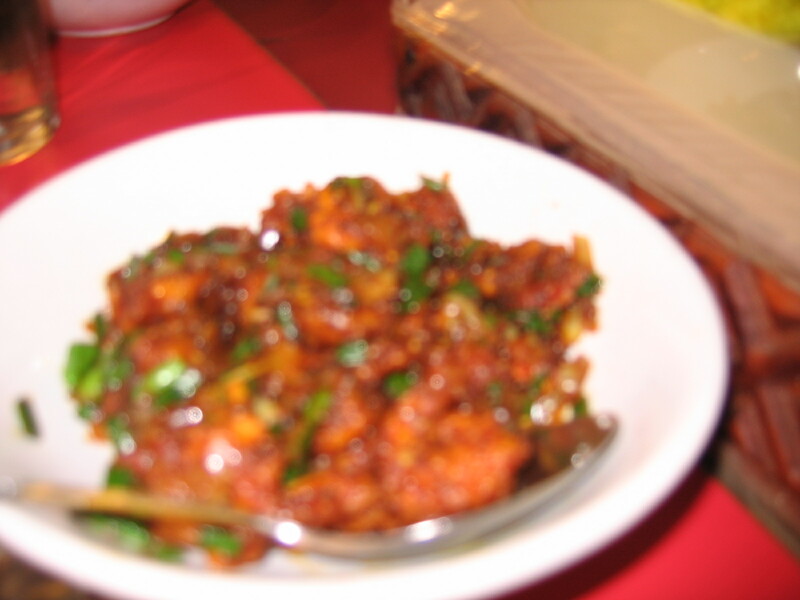 Big Chill, Kailash Colony Market – From the time I’ve been going to Big Chill there is this one dish I ABSOLUTELY have to order each time – Chicken in Red Wine Sauce. I can never tire of it. 6. Prima Kurien’s Keralan food- I had eaten food catered by Prima Kurien at my friend’s brithday party. In fact, the pictures below are those taken at that party last year. 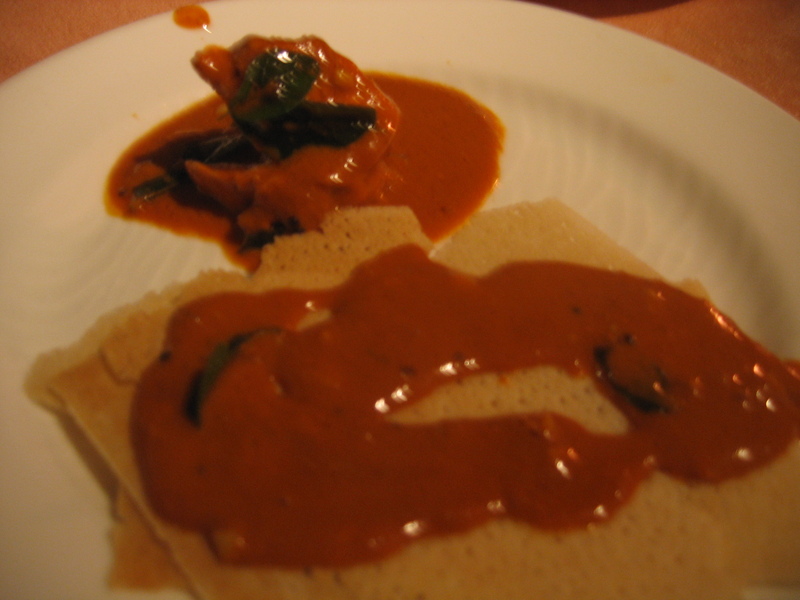 The menu included chicken cutlets, pork vindaloo, chicken fry, veg stew, and freshly made appams. Prima Kurien had sent a lady to make the appams hot and fresh while we sat down to eat. I loved everything I ate. Now, these friends hosted a farewell lunch for us and very sweetly had Prima Kurien cater for the party. 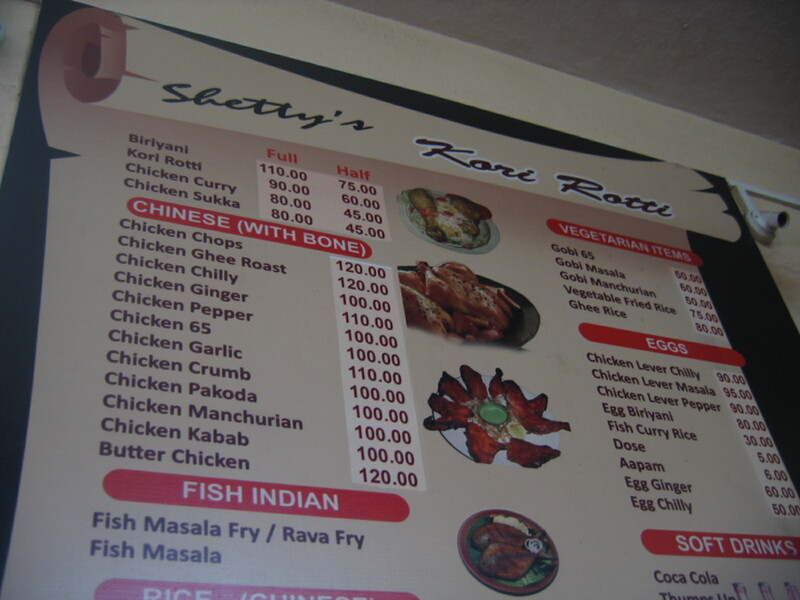 The menu boasted of chicken biryani, veg biryani, pork vindaloo, veg stew, and bread. I felt the vindaloo was better and the biryani was good too. 7. Yeti – My cousin A treated us at Yeti – a place that she had introduced to me in the first place. 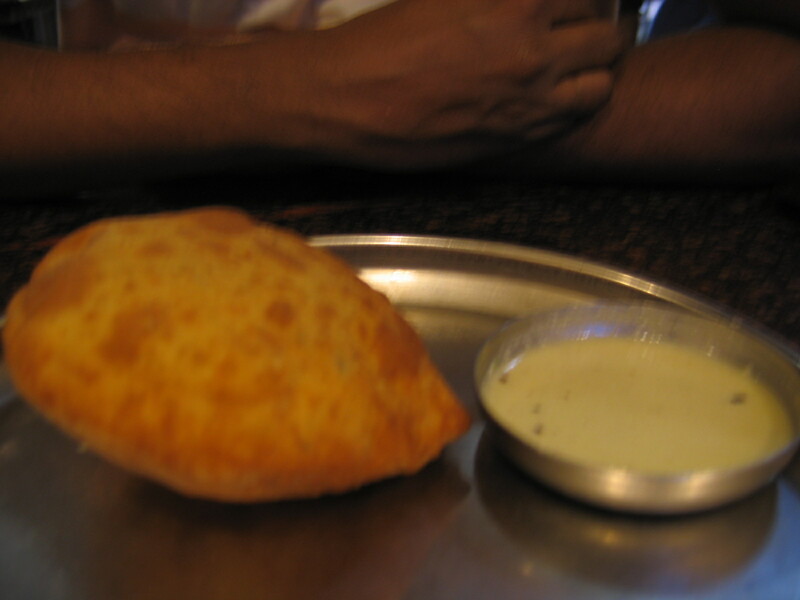 We had the tingmo with the cheesy spinach, chicken momos, and the delicious chem-chicken. 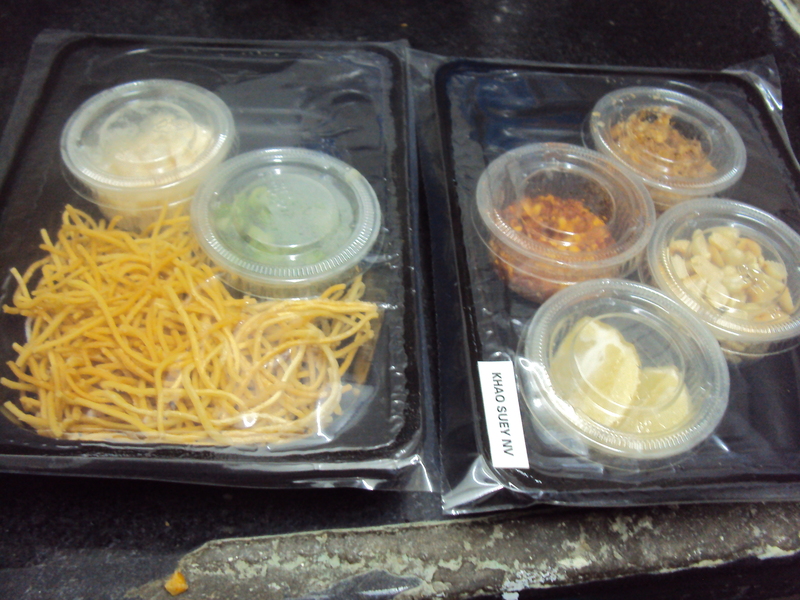 The pictures below were taken when we had food delivered from their Malviya Nagar branch. You can tell them to avoid putting MSG in your food and they will comply with your request. 1. Put 1 tbsp of olive oil in a pan and immediately add the oregano, thyme, and garlic. Toss for a minute or two and then add the sun-dried tomatoes. Toss for another minute. 2. Add the fish fillets, salt, smoked paprika, and pepper. Cook for 6-7 minutes or however long it takes for the fish to cook. Once it cools, flake the fish by hand and set it aside. 3. 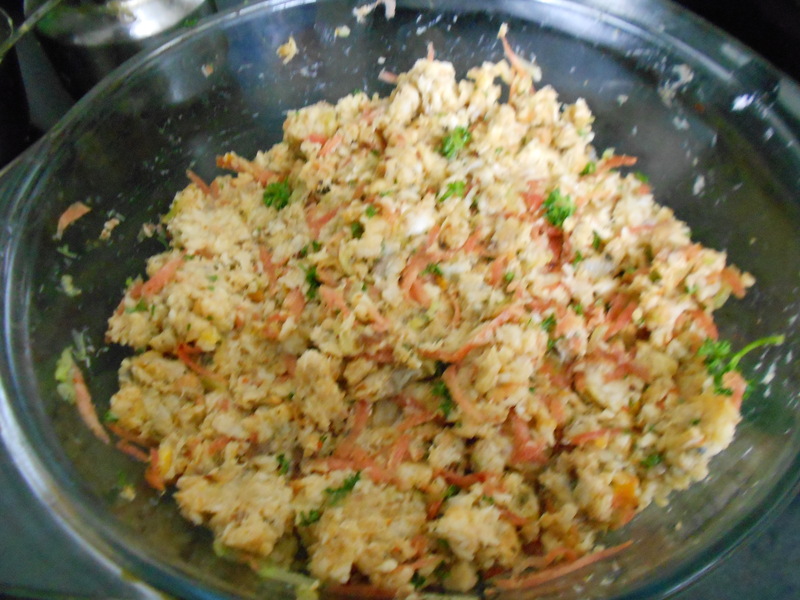 Add the grated celery, carrot, lemon zest, lemon juice, parsely leaves, celery leaves, and chilli flakes to the fish and place this in a baking dish. You could add some cheddar at this point into the fish. I did not and it tasted fine. 4. 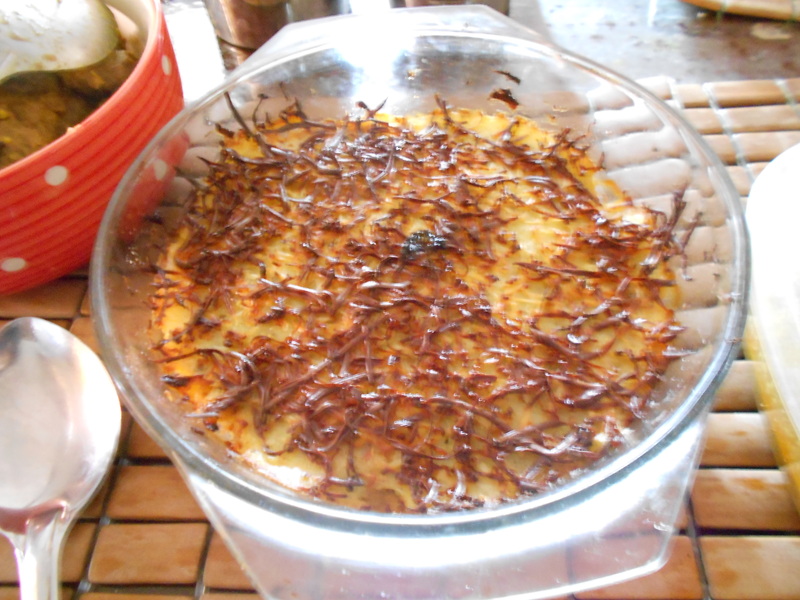 Grate the potatoes while they are hot, whisk with with some butter or olive oil and season with salt and pepper and some dried herbs (optional). 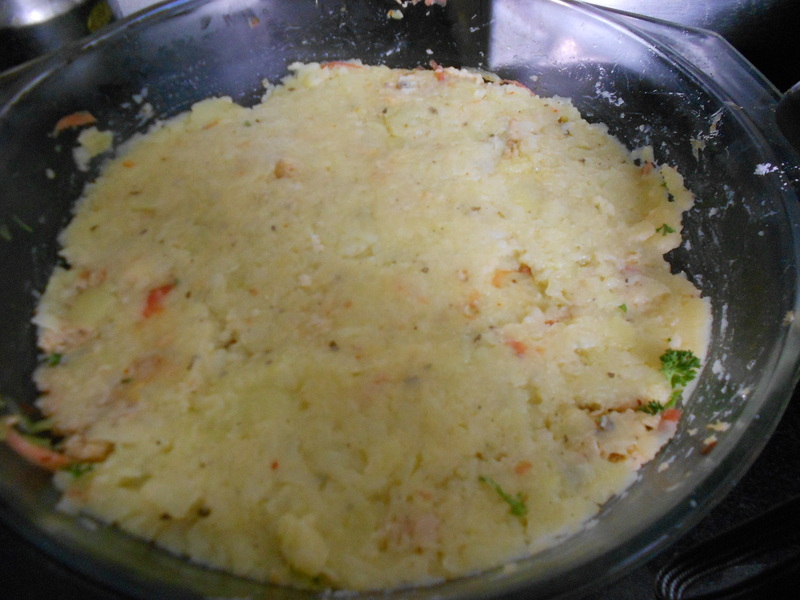 Add the layer of potatoes over the fish. 5. Grate cheddar on top as much as you like. 6. Place in a oven preheated at 200C for about 25-30 minutes. You could leave it for a bit longer for a crunchy crust. 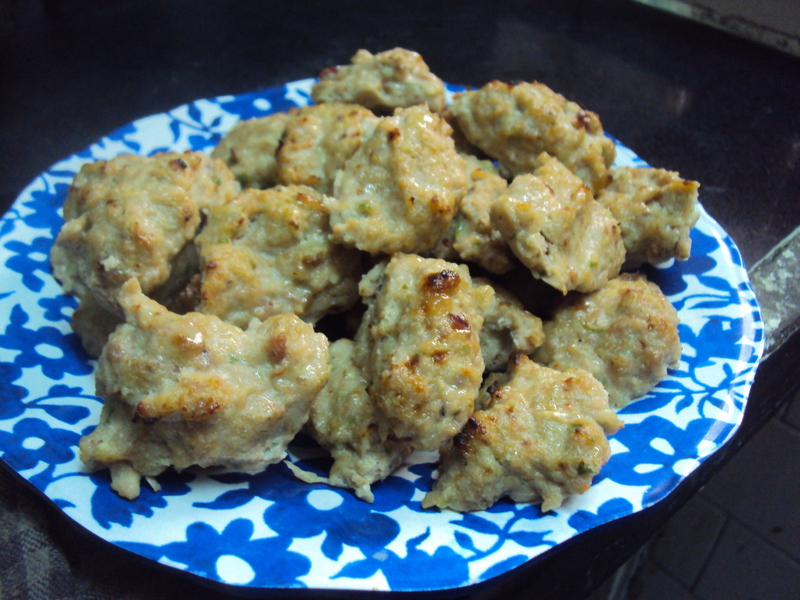 I got the recipe for meethi golis from my aunt in Kolkata. 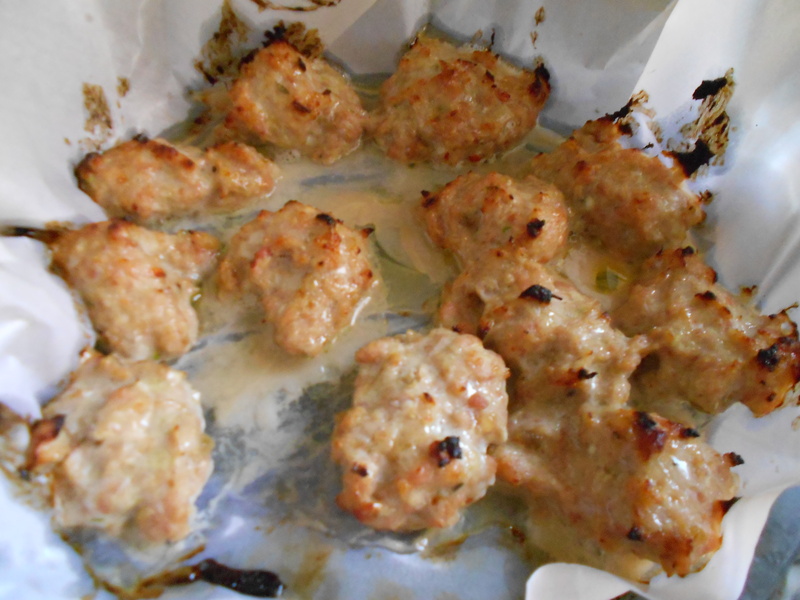 As the name suggests, these chicken meatballs are on the sweet side. 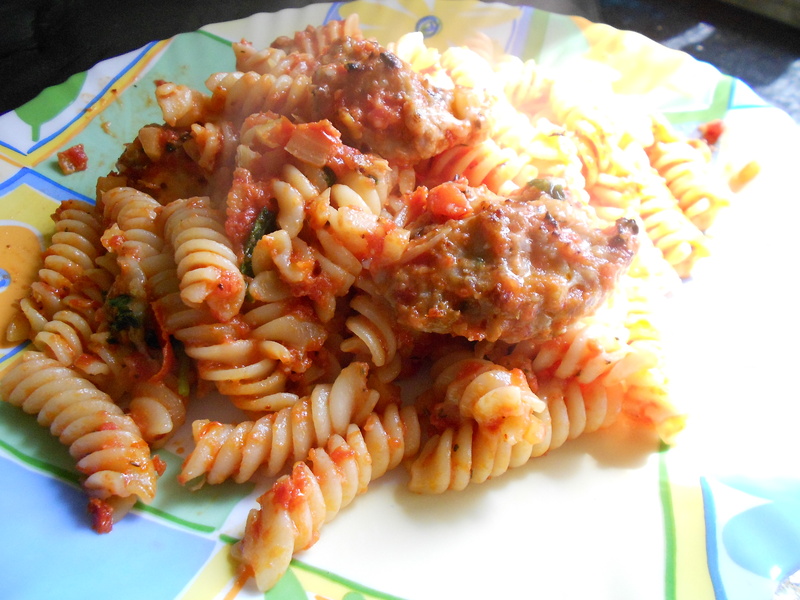 They are not overwhelmingly sweet though and are balanced by loads of garlic and green chillies. 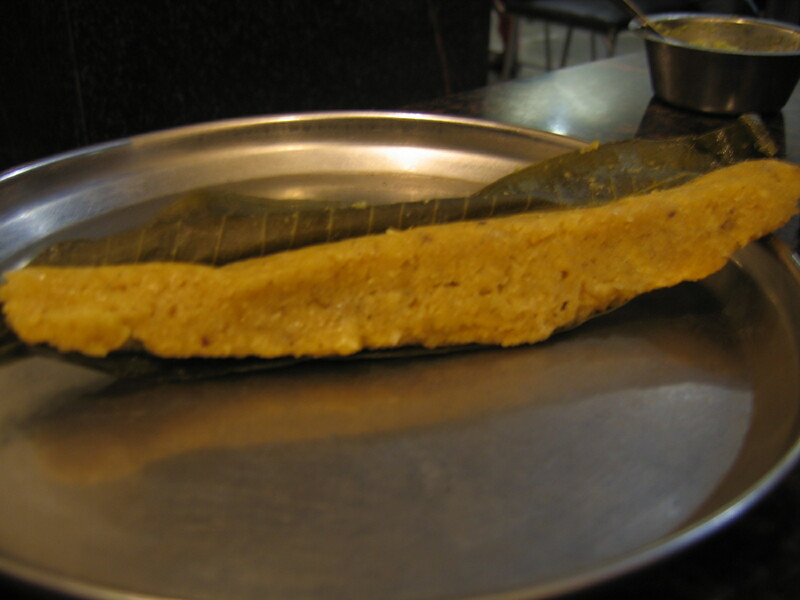 These golis are delicious and one can really innovate with them. 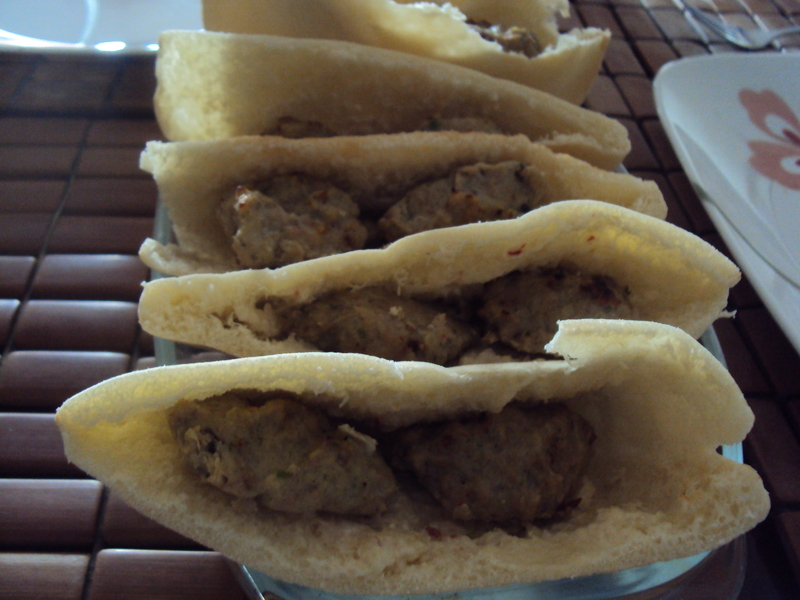 I’ve stuffed them in pita bread, dunked them in pasta, and even made tortilla rolls with them. They are quite yummy just like that too. 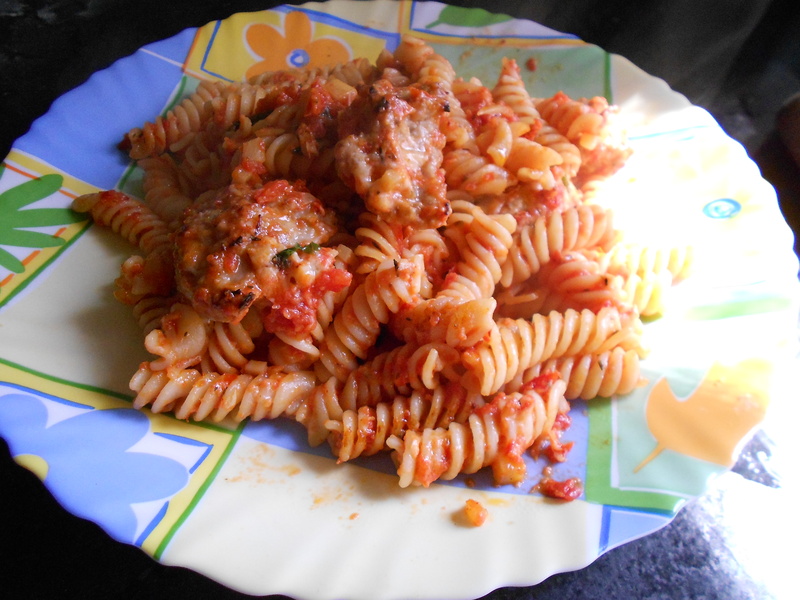 The recipe is very simple and calls for very few ingredients. 1. 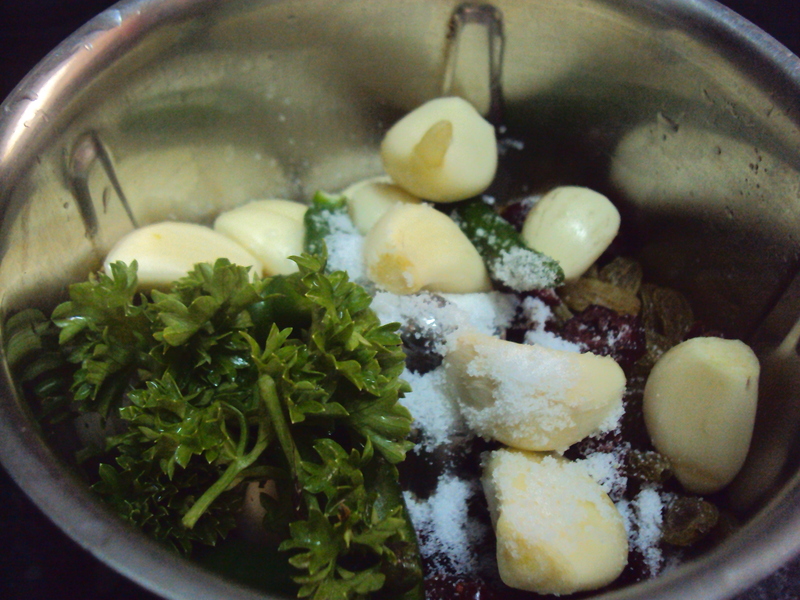 Grind the raisins, garlic, and chillies into a fine paste. Add parsley as well in case you are using it. You can add the salt at this stage if you like. 2. 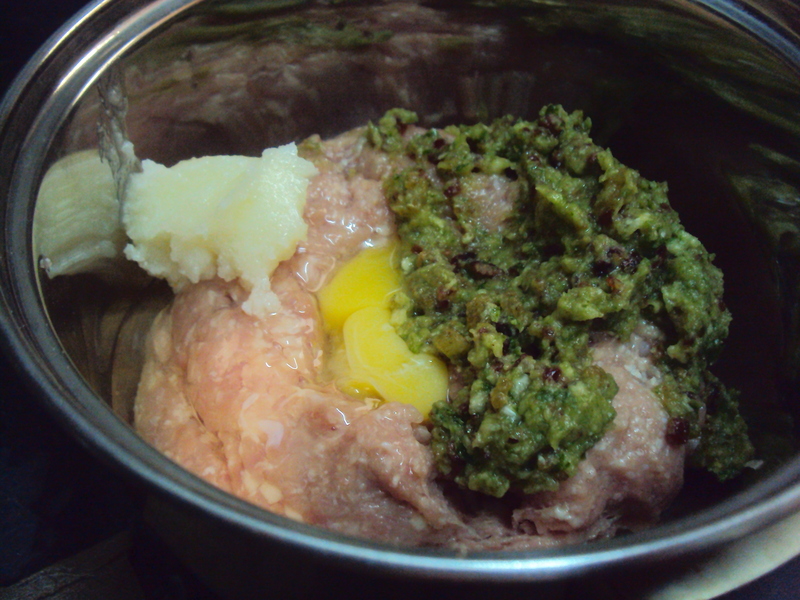 Add the paste, ghee, salt, and egg to the mince. Mix well. 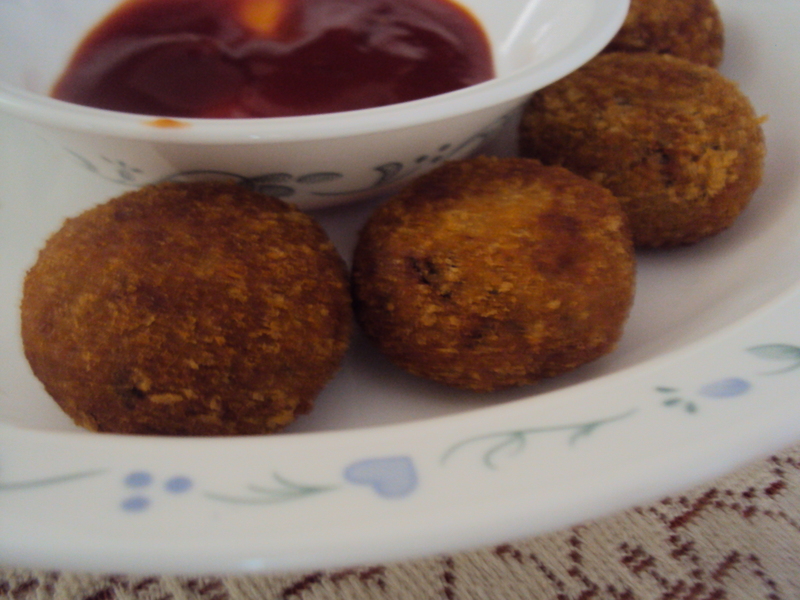 In order to check for salt and flavour balance test one goli by shallow frying it. Taste and then adjust according to your preference. You may want to add an extra chilli or chilli flakes in case it is too sweet for your liking. 3. Line a dish with parchment paper and with a tablespoon scoop the keema on to the dish. 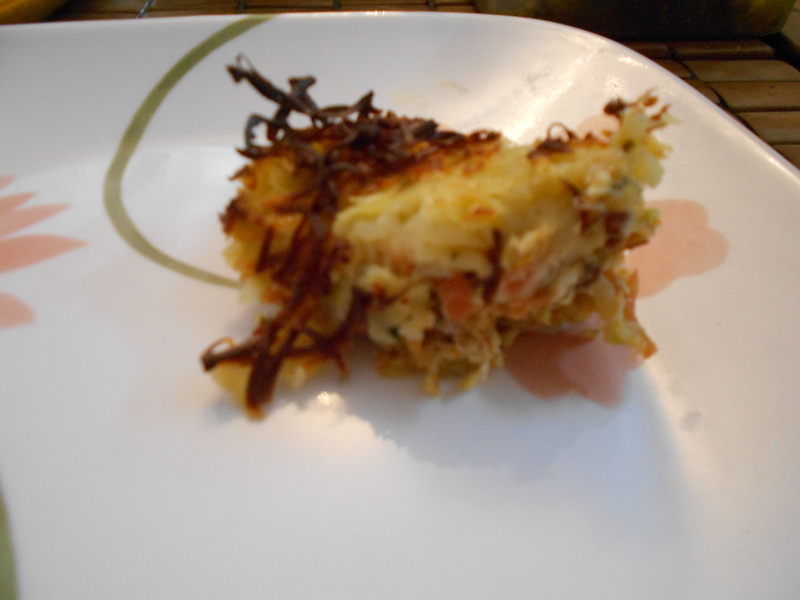 I’ve started using parchment paper while making this because it is easier to clean the dish afterwards. 4. Bake in a pre-heated oven (200 deg C) for 20 minutes. Remove and let it cool.